Soon after leaving the rest area this morning, there was a drastic change to the landscape. All the trees disappeared and were replaced by short dry grass that stretched for miles and miles. 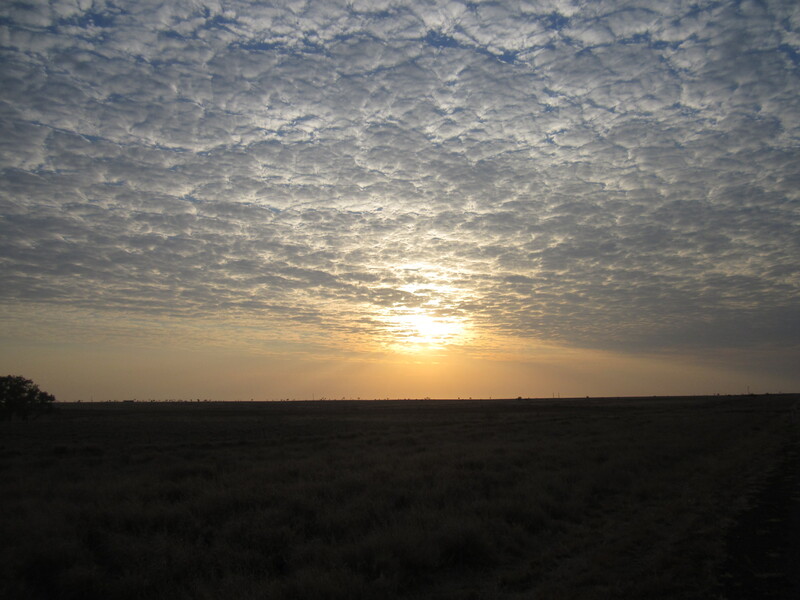 I have two options today cycle 65 km to Avon Downs and camp or cycle 135 km to Camooweal. I reached Avon downs at 11 a.m. and after a one-hour break………I forced myself to go on. 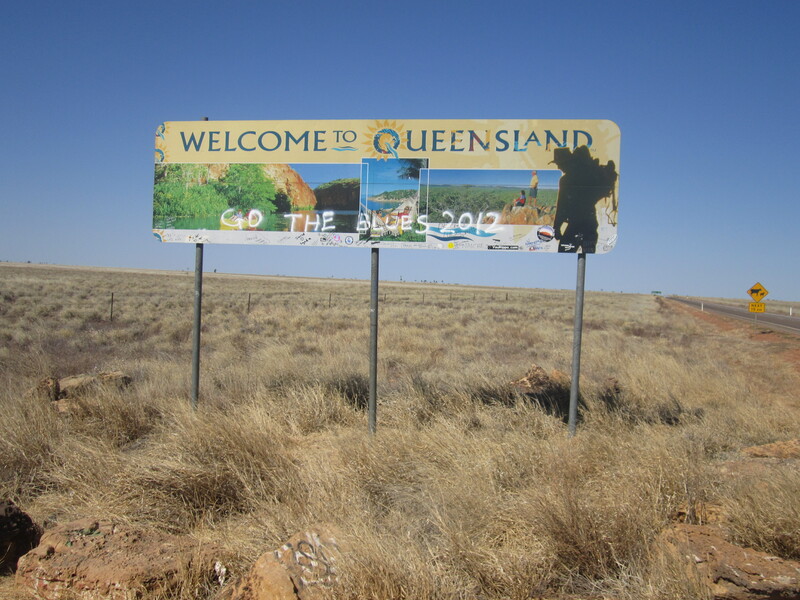 At 120 km I crossed over the border into Queensland. 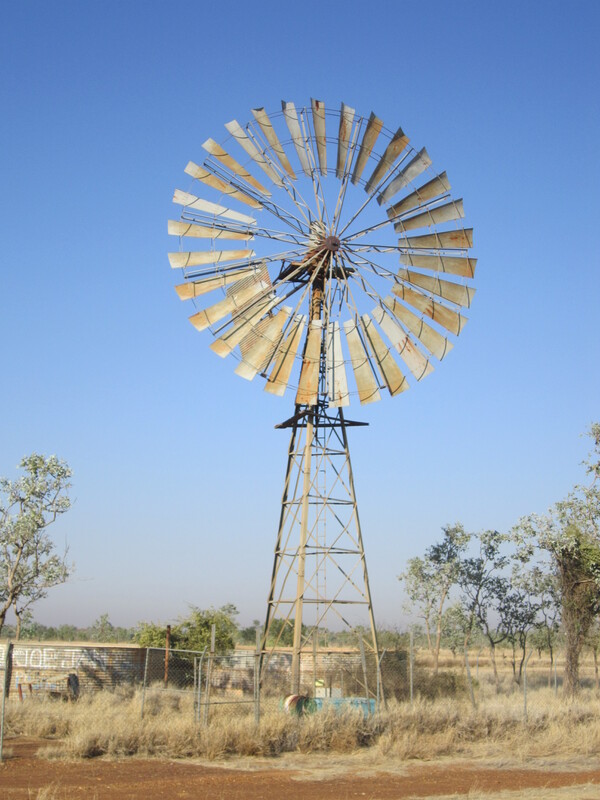 It was then only 13 km to Camooweal. For the last 6 km the legs were really hurting. I have camped in the free rest area down by the river. There are lots of nice birds around. There is an eagle nesting on the opposite side. I saw a couple I had met at 41 Mile Bore. They have invited me for some spaghetti bolognese. eagles, whistling kites and swans were the ones I could recognise. Dianne and Grahame invited me back for a breakfast of cereal, eggs on toast and a cup of tea. Very nice. 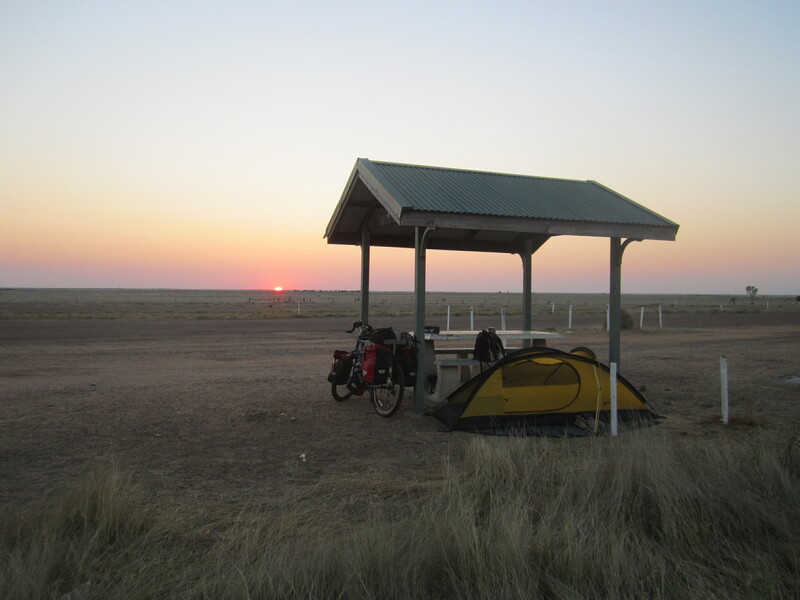 After breakfast I packed up my tent and cycled across the bridge into Camooweal. I pulled up at the roadhouse and a German couple came over to me and gave me a cold drink. 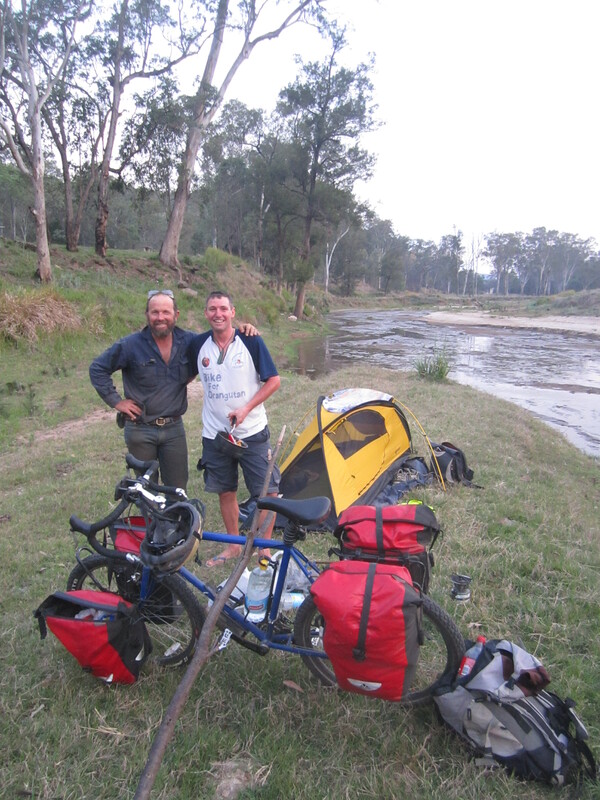 He said he had cycled the west coast of Australia about 10 years ago and said he knew what it was like. They had driven up from Brisbane two and a half weeks ago and he said he had wanted to give the first cyclist he saw a cold drink. I was very lucky that it was me. I felt a bit guilty since I hadn’t really earned it because I hadn’t worked up a sweat because I had only cycled over the bridge. Its a hot day and I am glad I am not cycling. I will do very little for the rest of it. Well, later on I went for a little walk into the town. Most of the shops such as the butchers, newsagent and garage had closed down. The post office was still open. It had been downsized and most of the building was now taken up by a supermarket. The forecast for today is 37 degrees and the following days. 38, 39 and 40. With that it mind I was up at 5:30 a.m. and moving in the dark at quarter past six. Conditions were favourable. No wind and a slight downhill. With a rest day I was feeling charged. I pushed out 45 km before I stopped for breakfast. Ended up having an extended breakfast because the back tyre went flat. After 1500 km I have my first puncture in Australia. I hope the next one is at least another 1500 km. 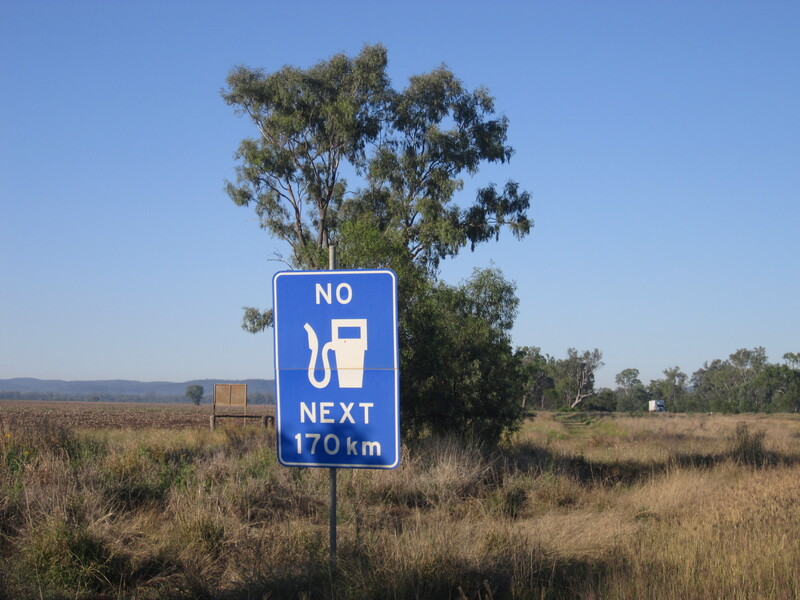 I have already noticed that the rest areas in Queensland are not as good as the Northern Territory. The first rest area I stopped at after 70 km was basically nothing. Just some leftover road materials that had been turned upside down to make a picnic table. No water, no fire pits and no shelter. I cycled onto 90 km. The rest area had a shelter. That was it. The signs for the rest areas are poor. 40 km turned out to be 47 km. So after 137 km I have arrived at the old WWII airfield rest area. I am now just 55 km from Mount Isa. There is a shelter here and I have camped under it. 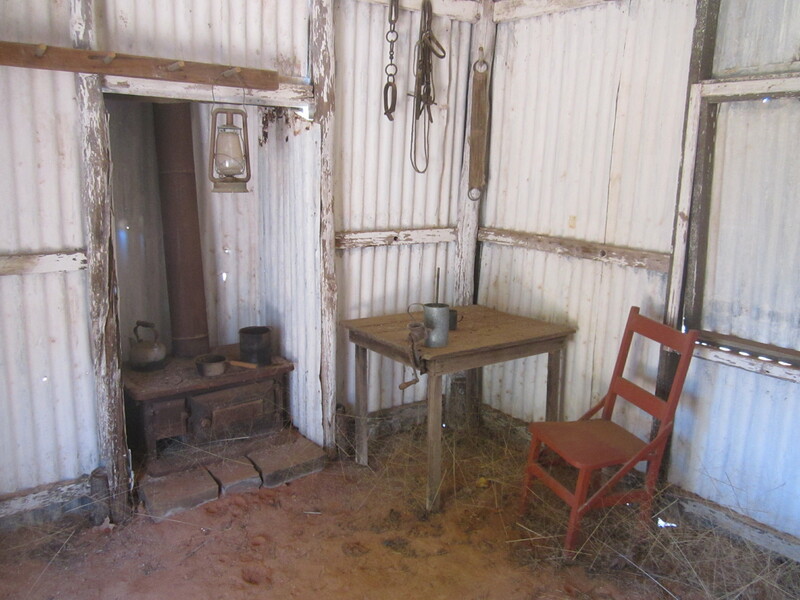 There is a toilet and BBQ but there is no water which means there is no water for 190 km between Camooweal and Mount Isa. Luckily I am carrying enough. I had a guy stop today on the road and ask me if I had enough water. When I got here some of the other campers gave me some cold water and a cup of tea which is always nice and appreciated. I was a bit late getting up this morning. The sun was already on the the way up when I woke up. With only 55 km to Mount Isa, I had a bit of a spring in my step knowing it was going to be a short day. With the help of a little wind and the declining road, I was motoring. After 1h 22 minutes I had cycled 35 km. Getting close to Mount Isa the landscape changed with some small mountains appearing and small mines started appearing on the landscape as well. 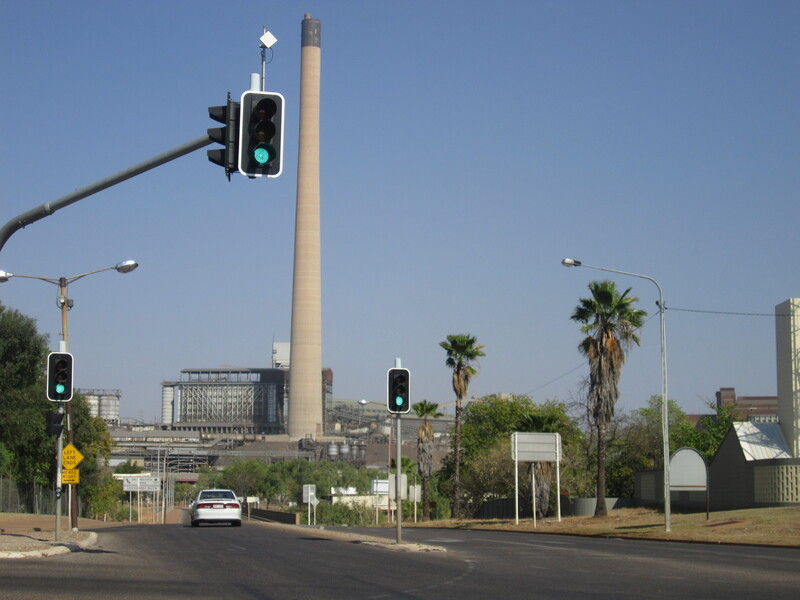 Getting into Mount Isa there is a very large mine less than 1 km from the centre of town. I cycled straight to McDonalds for some free Wifi. It has been 10 days since I was last able to catch up. Here I met a retired English guy travelling round on a motorbike and he recommended a good campground close to town. So after my big Mac meal I cycled up there. As soon as I cycled in, I ran into the Aussie couple I have now run into for the third time. I camped behind them and they gave me an extension cord and power point with light to run out to my tent. So I have a few extra comforts for the next couple of days. Grahame and Dianne have really been looking after me. I was able to go supermarket shopping with them which saved carrying my groceries back to the campground. They invited me for dinner again – beef stir fry. Beats my standard rice or pasta. The English guy invited me for some beers. He went off and came back with some beers and a big roster. I really am getting looked after. Tomorrow morning, I have been invited for breakfast with Dianne and Grahame. They asked me if I like bacon and eggs. When I arrived in Australia I bought a prepaid Optus Sim card. 1 month later I was only able to get a signal in two places in the last 1500km. 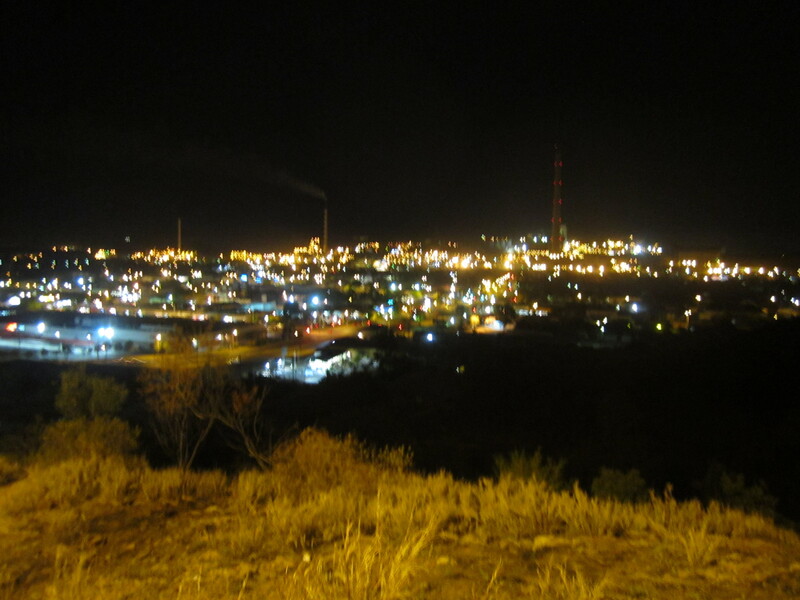 When I arrived in Mount Isa the first message I got was your credit expires tomorrow. I checked the balance: $26, so I thought I had better use this up quick and started calling the world………..Mum and Dad in NZ, friends in Indonesia, relatives in the UK and France all on landlines and mobile. It was great catching up with everyone and actually really noticed the improved quality compared to Skype………..Checking the balance after my hours of calling……..$25……..I was still on the phone at 12:30 a.m. this morning. I just hope the people I called haven’t had to pay. Day 539: Friday – Was treated to bacon and eggs by Dianne and Grahame. Nice change from the usual muesli. They then dropped me at McDonalds and I struggled on the Internet for a few hours. Was going to do a mine tour but at $60 I decided to give it a miss. |I did walk up to the lookout and take some photos of the town before walking back to the campsite. Made good use of the swimming pool before having a quiet evening. I have already decided I will stay one more night. Day 540: Saturday – I am getting spoilt. Dianne and Grahame had me over again for some baked beans on toast. I then dedicated the day to a day on the computer. Dianne and Grahame left today. Opposite them is a semi- retired Kiwi couple who kindly invited me to join them and some Aussie friends of theirs to go out to the dam 14 km outside Mount Isa. We went for a walk on the dam wall and also up to the lookout. We then sat down by the lakes edge drinking cold drinks while chatting and watching a few speedboats and water skiers. That evening the Kiwi couple very kindly invited me to join them for a very nice meal at the Irish club. Afterwards we went up to the lookout point in the city. The mine was lit up like a Christmas tree. Sunday morning and I headed out of the Isa. It was very hazy from the smoke from the bush fires that are burning out of control. They have been burning for weeks but they are not trying to put the fires out because they are so remote. It was very hilly. With a few good climbs I had a few good down runs as well. The wind was all so favourable. This helped make good time and at 10 a.m. I reached Fountain Springs rest area and having done 60 km I was half-way. I was going to camp at the lake nearby. 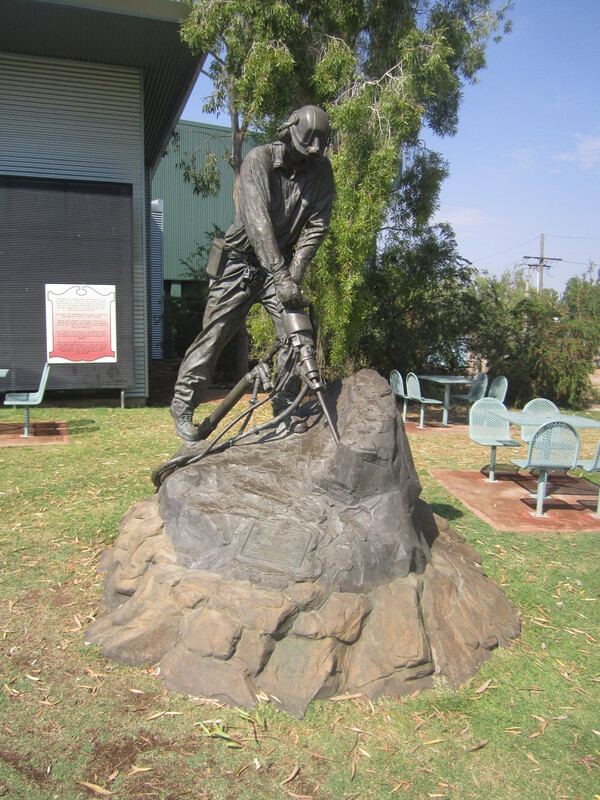 But since I stayed an extra day in Mount Isa I have had to sacrifice it. 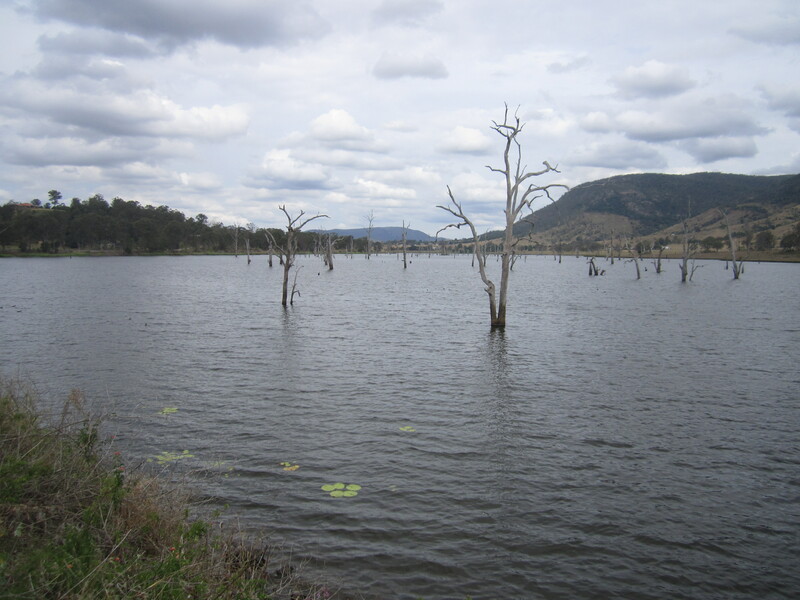 The history with the lake is that it used to be part of an Uranium Mine. The area is full of mines. On the other side of the road and a few km inland were the remains of an old copper mine from the turn of the century. After my break I continued. At 90 km I hit the limit. The temperature was up to 40 degrees. Cycling in to a hot breeze didn’t help either. My legs were aching with tiredness. 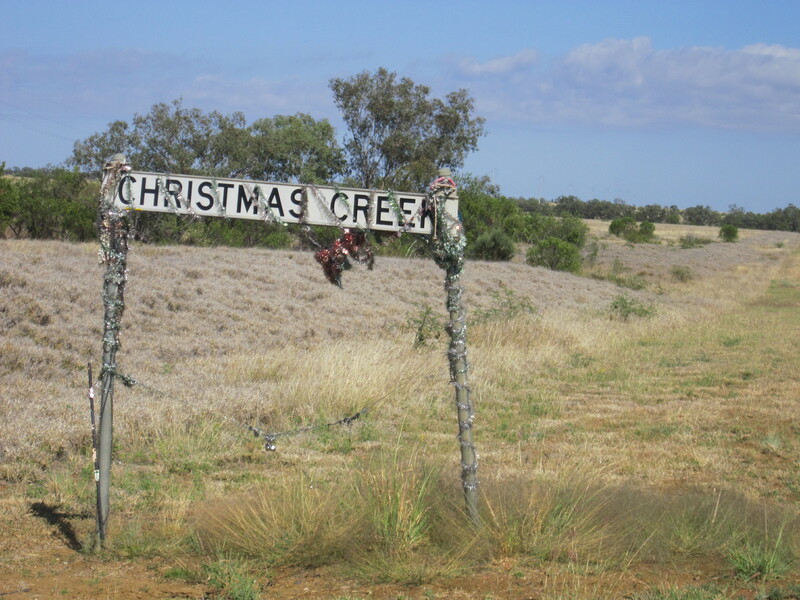 When I got to Cloncurry I followed the signs for Wal’s camp. When I got there I found it was pretty basic for $15. 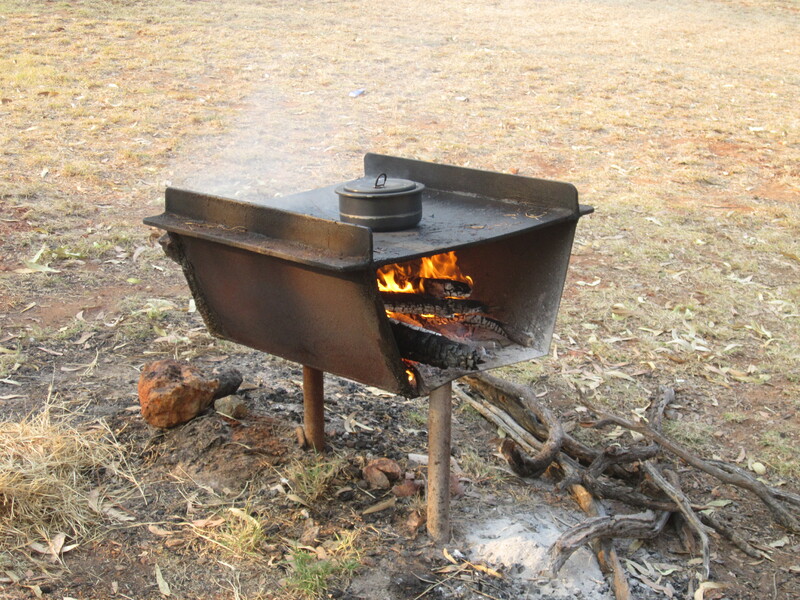 The kitchen only had a wood stove. No fridge……..in fact no power so couldn’t even recharge my GPS or phone. I started chatting to an Aussie guy staying there. He gave me a cold pepsi which was great. All afternoon I had been drinking warm water which had made me feel a bit sick. I decided I wasn’t going to stay. The Aussie guy told me about a dam just out of town where I could camp for free. But before I left I went and had a sneakie shower. I was overheating and needed to cool down. The dam was only a few km out of town and I parked myself up next to some picnic tables by the BBQs and only a few hundred meters from the lake. I was still hot so I went for a swim. A few people were swimming and a few were out in boats and water-skiing. After my swim I cooked some dinner on the BBQ. It said no camping…….so I went a little way around the lake before I found a place to put the tent up. Not far from the water I had pelicans, shags and storks resting on the water in front of me. 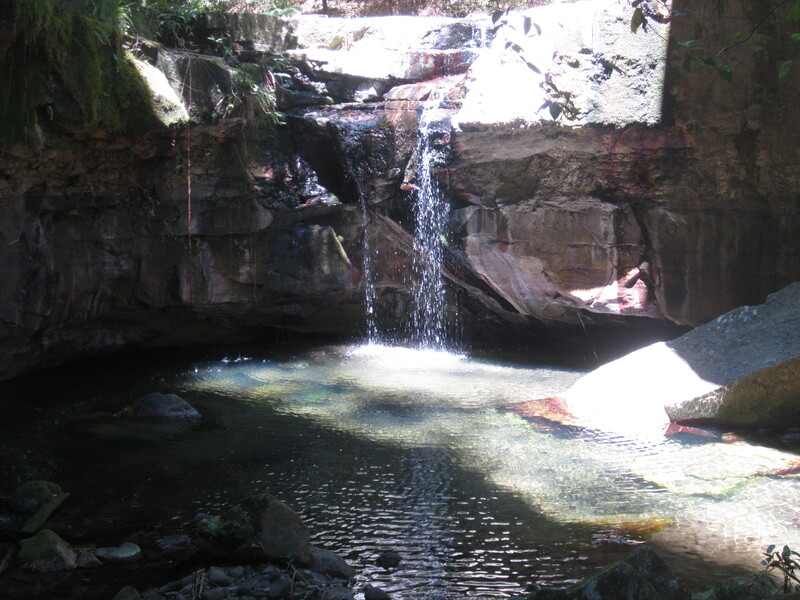 I then went for another swim because it was still so hot. Around dusk a thousand White Cockatoos flew across the lake. At this time everyone left and I now had the lake to myself. Just before midnight the wind got up and there were a few drops of rain. I leapt out of the tent to put the fly on. A few drops was what it was because after that there was no rain at all. I didn’t sleep well last night because it was so hot in the tent. As I packed up the tent hundreds of cockatoos flew across the lake. The pelicans were back as well. I cycled back from the dam and stopped off to look at the Chinese cemetery along the way. There is also an Afghan cemetery from the period when the Afghans used to ride the camel trains. 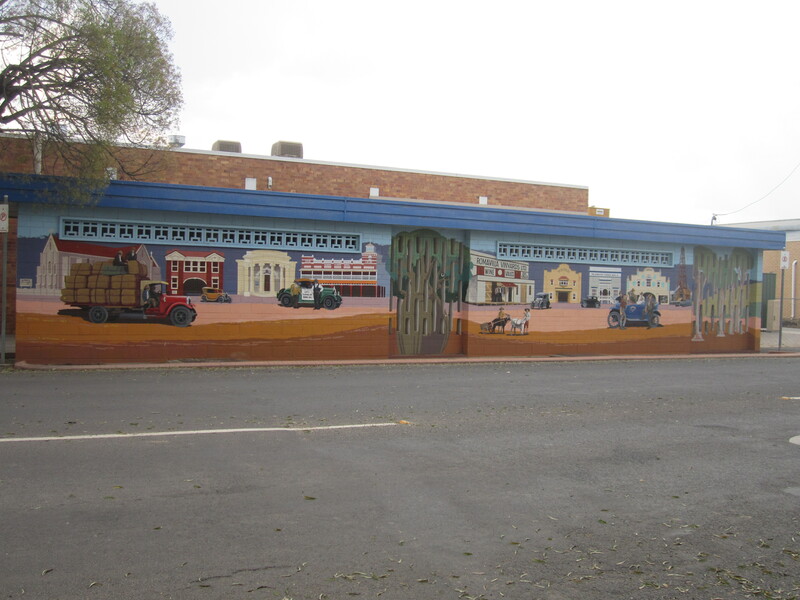 The streets of Cloncurry were quiet at 6:30 a.m. The main street had some nice old wooden buildings. The bakery was open so I stopped there for breakfast. Today I have a rest area at 65 km and a town at 113 km. I will aim for the town. 11 km from Cloncurry the highway branches off. If you keep going straight you would go to Townsville. 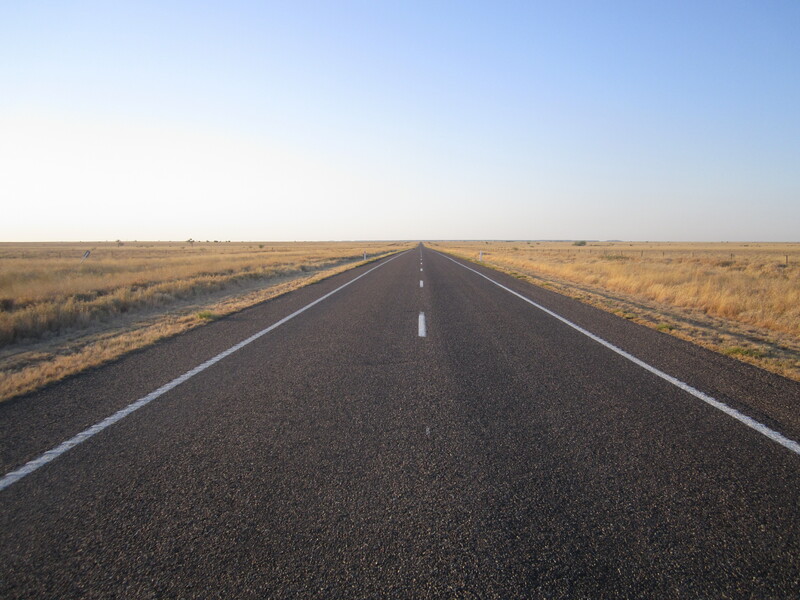 I turned off onto the Landsbrough Highway which will go to Winton, Longreach and Emerald. I have already noticed there is less traffic on this road, which is good. The road was very hilly this morning with lots of ups and downs. I reached the 65 km rest stop around 11 a.m. Soon after the Aussie-Kiwi couple that I first met at Katherine Gorge and then again two days ago at the caravan park in Mt Isa saw me and called in to say hello. They kindly offered me more water and gave me some fruit. The afternoons are always so tough to cycle. For the last 20 km my legs were so tired as I cycled into a hot headwind on a road that is now crossing open plains and with no shade. 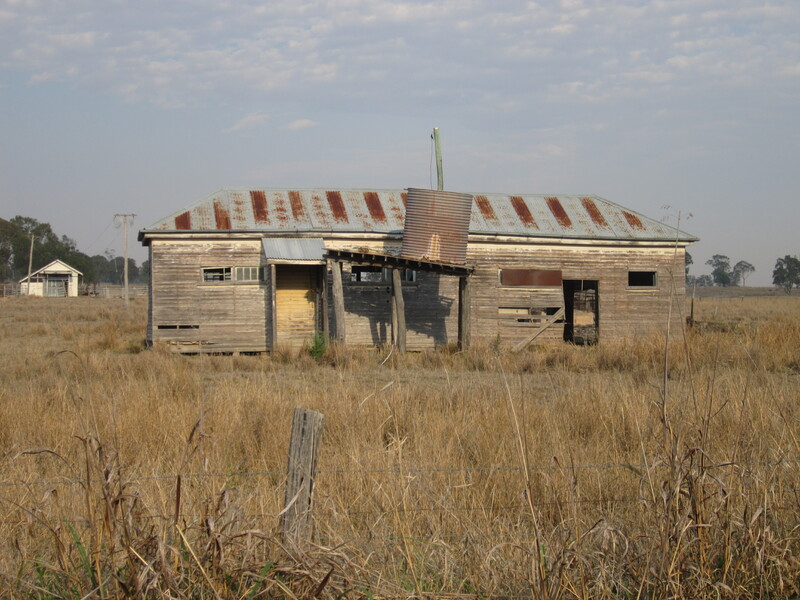 McKinlay was once a very thriving town. 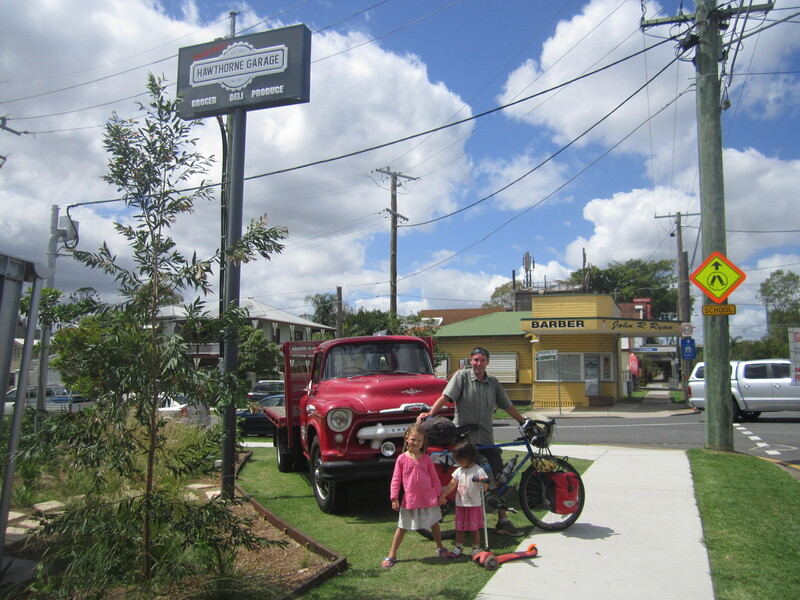 It has the usual roadhouse, a pub, police station, Queenslands smallest library, the old hall, a few boarded up shops and a few houses. I am camping behind the pub which is somewhat famous because it was the pub in Crocodile Dundee. Camping was $12 and I felt a little bit short-changed because there is no kitchen and no fridge so I can’t have any cold water for tomorrow. I have ended up going to the roadhouse and having a meal while cooling off in the A/C. This morning when I left the Crocodile Dundee pub. I had the option of going just 75 km to Kynuna or 150 km to Wanora Downs rest area, or I guess anywhere in between. It’s psychological but I really thought the latter was out of the question and I was going to be happy just to stop for the day in Kynuna. The Landsbrough Highway is now cutting through big open plains with lots of cattle. I got to Kynuna at 11 a.m. 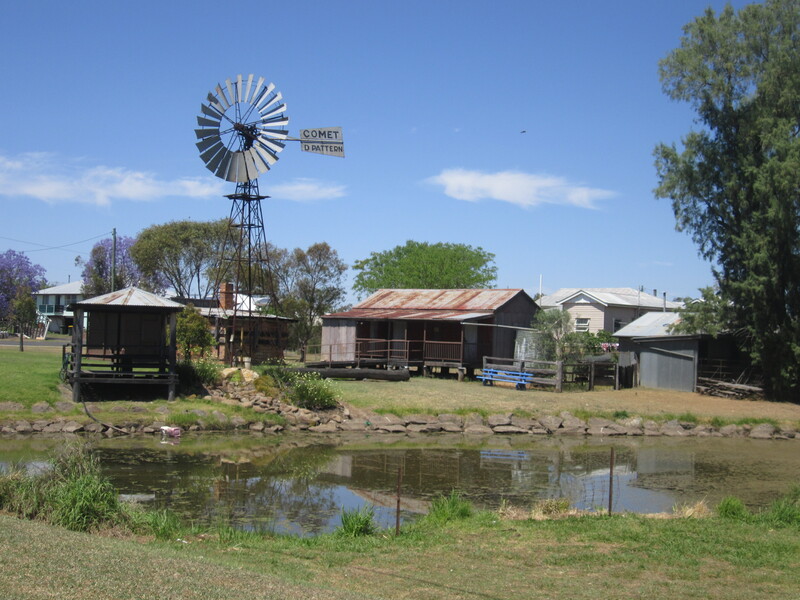 The towns claim to fame is the Blue Healers pub which is apparently where Banjo Paterson wrote Waltzing Matilda. I tricked myself into thinking I was going to have an easy day and stop at Kynuna. But I talked myself into going on a further 75 km. I decided to have a big lunch of sausages and veggies and a nice cold drink in return for going on in the 38 degree heat of the day. I restocked the water and on I went for 75 km with no shade. I was happy to reach the rest area at 4 p.m. The mouth was really dry and I cracked open a tin of mangos. Drinking the juice first, before eating the rest. Having no cold water is painful. I am now 90 km from Winton and I will definately be stopping there tomorrow. they told me to check out the North Gregory hotel. Turns out they let campers camp for free behind the hotel. the law was changed so that the council could build and own the town’s pub. 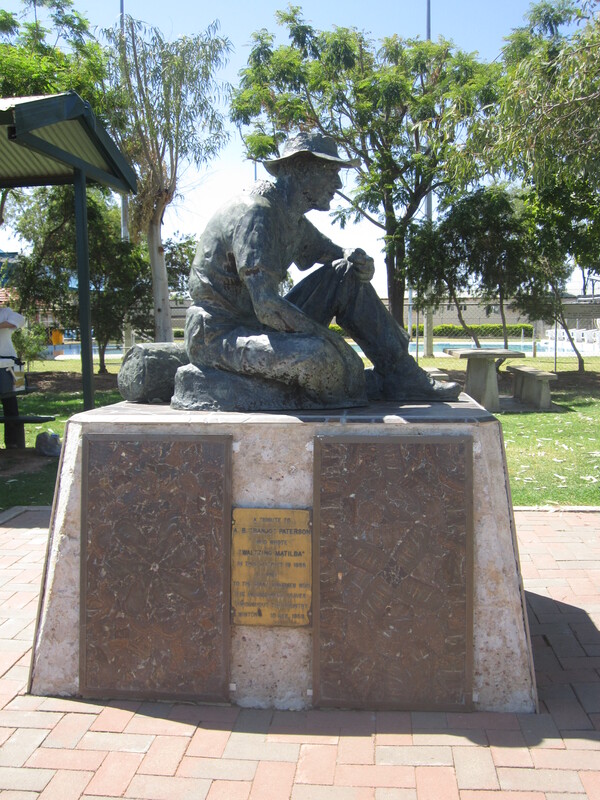 There are Banjo Paterson monuments all around town and the Matilda museum. The club house was where Quantas board members had their first ever meeting in forming the airline. Out the back of the hotel is Arno’s wall. 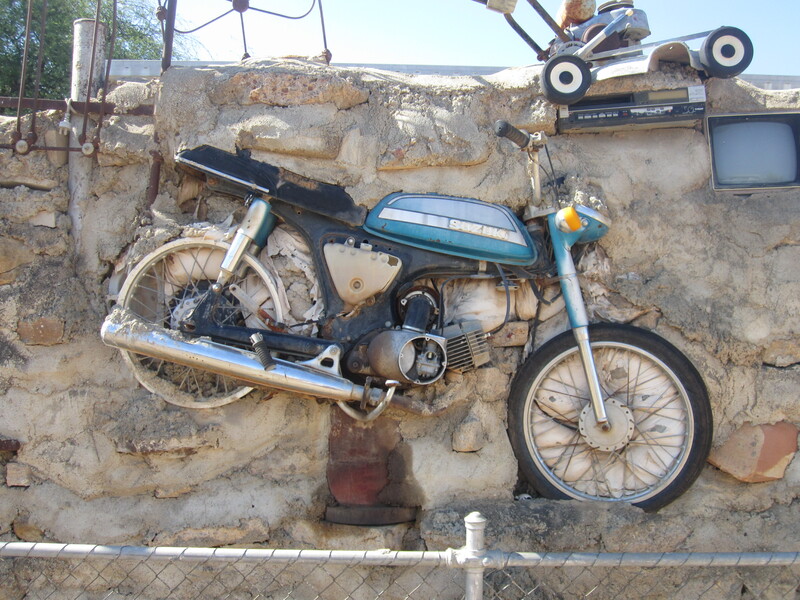 Some old guy collected all sorts of thing from the rubbish dump over many years. He then cemented them all in to a wall stretching over 100 meters and therefore creating a interesting tourist attraction. While out walking the streets I bumped into Nick and Joe. The Aussie/Kiwi couple I have bumped into 4 times now in the last month. They invited me down to their caravan park for a BBQ. We called into the butchers and got a very nice piece of steak for only $5. Then magically I got a plate of a very tasty BBQ steakand vegetables – thanks to Nick and Joe. It was a nice evening sitting outside chatting and eating dinner. The glass of red wine was also a nice treat. The Australian hospitality is wonderful – I am starting to get a steady list of invites. 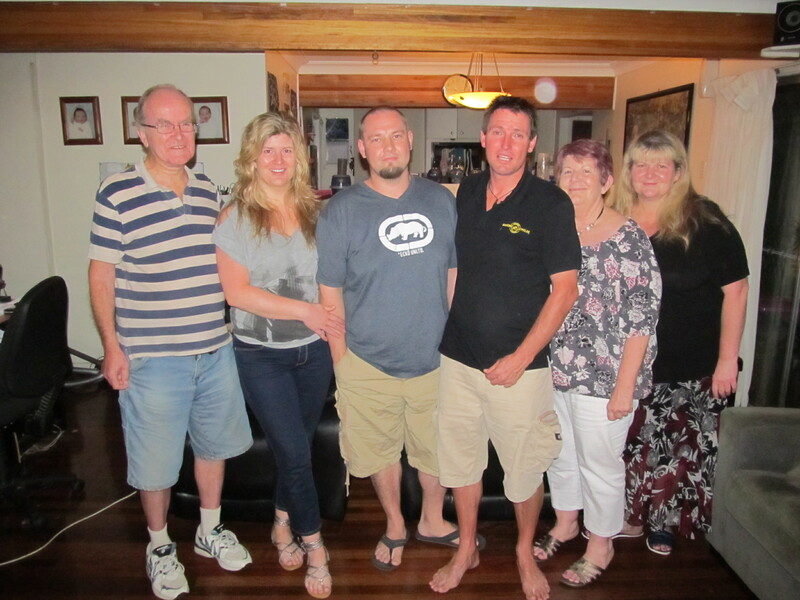 The English guy Adrian I met in Mt Isa asked me to come and stay with him and his wife in Sydney. I met a group in the hotel foyer yesterday and ended up with an invite to Central New South Wales and this morning while I was packing up a couple travelling on a motorbike have invited me to visit them on their farm in Tasmania. Then later in the day I met Louise again. I first met her on Monday, 4 days ago when she was going to Mt Isa. Now on her way back she stopped and gave me some fruit, muesli bars and some sweets. She must of thought there was a pretty good chance she was going to see me on the road again because she had prepared some notes for me on the next upcoming towns concerning accommodation and things to do. She has also proposed that I text her in two days time and she will bring me out some lunch to the highway. talk about going out of your way. Louise is also going to try and organise it so that I can go and camp on the lawn of some of her friends that live in Longreach. 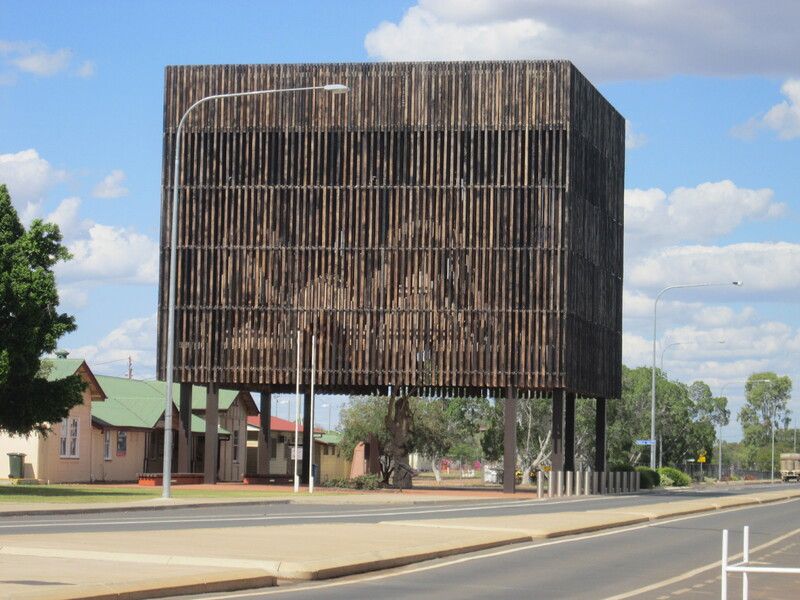 Next town Longreach is 168 km away. It was a real battle from the moment I left Winton this morning. Physically and mentally. The wind was up and it was a mission cycling into the bloody wind on the big open plain. Mentally it is very demanding as you seem to put in so much effort for so little return. After 112 km I stopped at the free rest area and have set up camp. I have already been given one cup of tea from some travellers that briefly stopped. Making it the secound cup for today because at the first rest area a Dutch couple gave me a cup of tea and cake for morning tea. The one thing at present that is driving me crazy is the flies. They won’t leave you alone and there is no respite. turning to watch me from a safe distance as I passed. It was a sad sight this morning when I passed within a metre of a kangaroo on the side of the road and it was in some distress. I only saw it as it tried to move at the very moment I was passing it. I think it had just been hit by a car and was either stunned or was unable to walk because it had a broken leg. 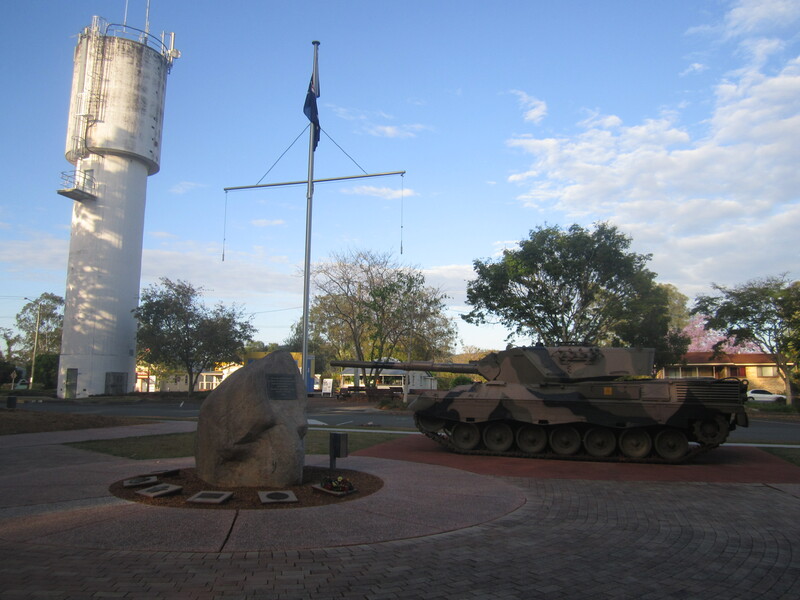 I got into Longreach around midday. With Optus reception back, I spoke to Louise who I met the other day. Yes, no problem I could stay at her friend’s place. Just a few blocks from the main street. Instructions were………just go round and make yourself at home……….the girls will be home at 5 p.m. How trusting. I went round and felt better when one of the girls, Amy, was home. The ABC rural reporter made me feel very welcome. She has a lovely old house that had been recently modernised. But still retains its character. I have put my tent up on the very spaceish veranda. It wasn’t long before I signed myself up for a night of events. 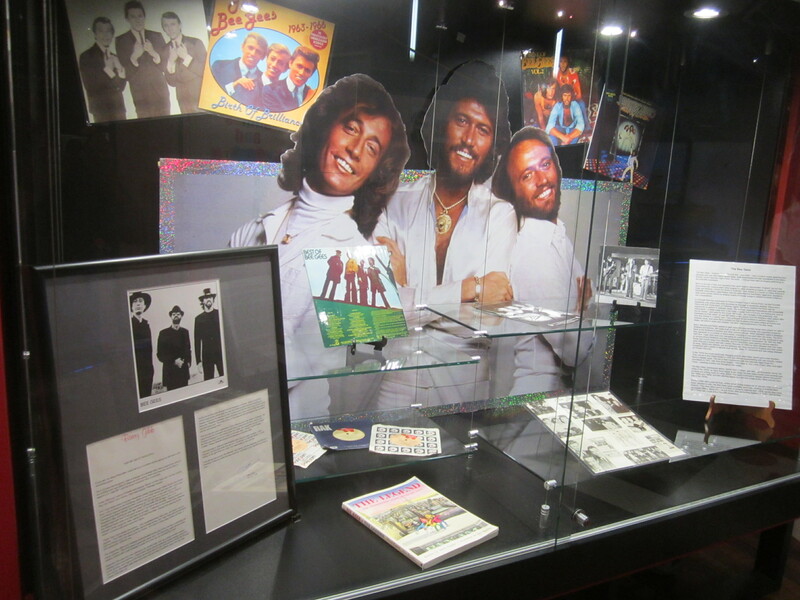 The highlight of this was a concert at the Stockmans hall of fame where Pete Murry and Busby and Maroo were performing. This was preceded with pre-drinks at a small house party and followed by a trip to the local country pub. At 5:45 a.m. this morning, for the first time in Australia it started to rain. It has instantly brought the temperature down to a more bearable level. Neither the rain or the fact that I was out last night has really factored into staying another day in Longreach. My friend Rach has asked me to slow down as she is currently away in Brisbane. I am also in need of a break after nearly 700 km in 6 days. 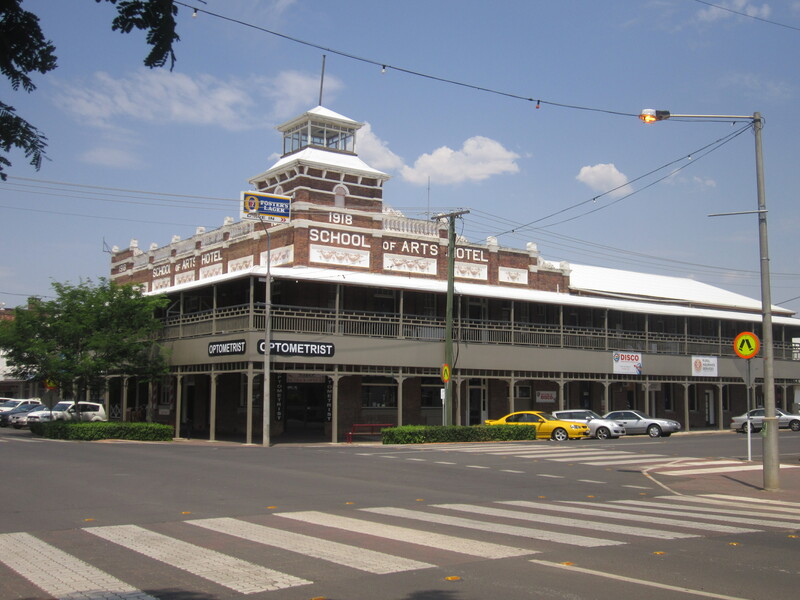 The main attractions in Longreach which are the stockmans hall of fame and the Qantas museum are a bit pricy for me. So alternatively I walked down to the nature reserve on the edge of town. I did a 5 km loop through the bush, passed billabongs and through the open pastures. The reserve was full of many birds and as I walked along I came across 40/50 kangaroos that would hop off as I approached. That evening, we had a nice BBQ at the house. Bron made some very nice salads to go with the freshly caught fish and steak. 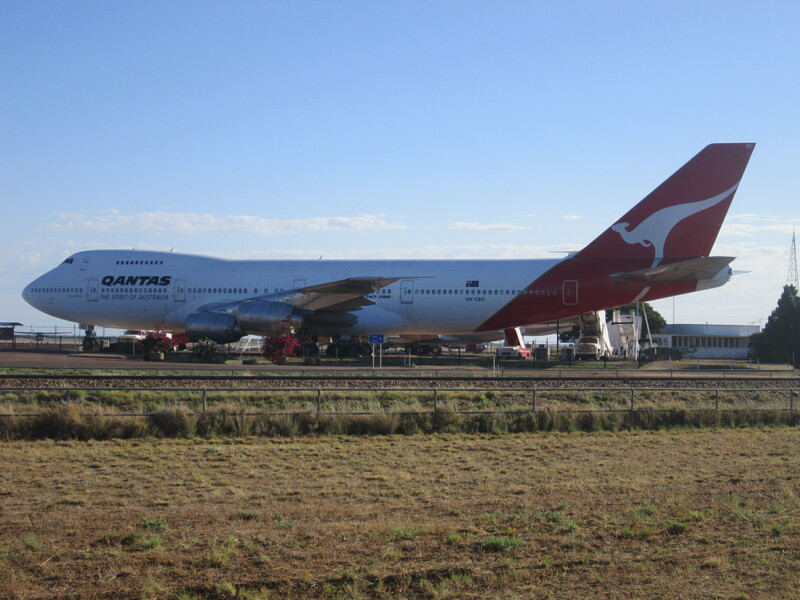 On the way out of Longreach this morning I stopped off to have a look and take a few photos from the fence at a few of the planes at the Qantas museum. I didn’t go far today only 29 km to the next town, Ilfracombe. It was well worth stopping. The small town is full of character. On one side of the main street is a row of about 50 old tractors, graders, trucks and ploughs which took a bit of time to look at then there was a small folk museum with lots of old stuff to see. Next to that was the light horse museum. I paid the Bottle museum a visit as well. I think there were about 16 000 different types of bottles to look at. Behind the tourist information there were the old police cells looking as comfortable as ever. Bron gave me some bacon to take with me so I went round and used the BBQ at the swimming pool. Prior to that I met a kiwi guy travelling Australia with his caravan. When I mentioned I couldn’t get any bread since it was Sunday and the shops were closed. He kindly gave me 6 slices of bread and a couple of eggs as well. 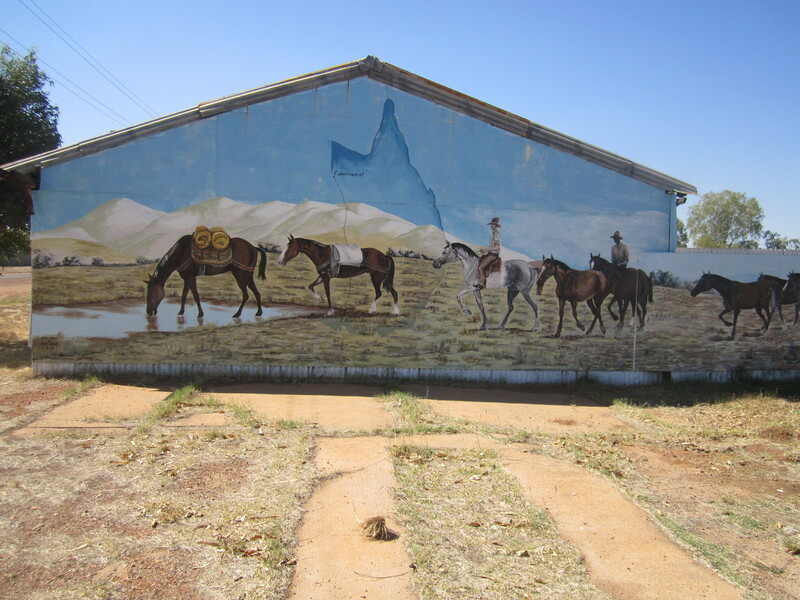 I got a contact for a place to sleep in the town when I met another Kiwi guy John at the supermarket in Longreach. He said to call in when I got to Ilfracombe when I got here. So I did. Actually I ran into him when I was cycling about town. He was mowing the lawns in front of the local school. So he said to go over to the house and he would be home soon. 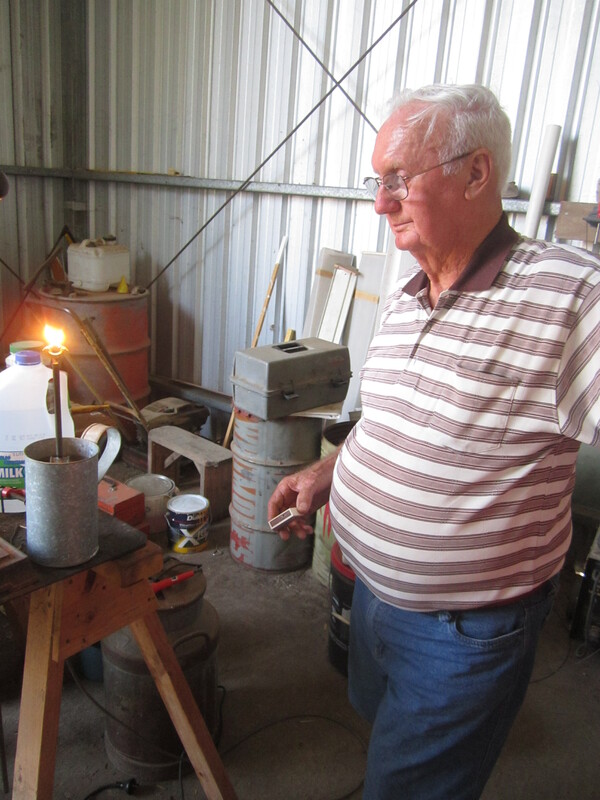 John does a couple of rural postal runs, mows lawns and in the weekend runs a plant nursery from their house. His wife Dianne runs the local post office and the nursery at the weekends. As always they made me feel very welcome. I pitched my tent on the back lawn. Drank lots of tea, watched some rugby on their massive TV and had tacos for dinner followed by apple crumble and ice cream for dessert. I really do get spoilt. John and Dianne got up this morning and cooked bacon and eggs for breakfast. What a great way to start the day. Before I left I picked a few mandarins from the yard to take with me. 22 km down the road Louise and her young two boys Harry and Will came out to the main road to meet me. I was given some lasagne to reheat for my dinner tonight and some cake and chips as well. They have a sheep station and said I could have come and seen the shearing which starts tomorrow if I had had time. Cycling along I saw two heads coming out of the long grass……..at first I thought they were just sticks. They in fact belonged to two emus. Then only another 100 meters down the road was another emu running through the grass. It came out of the grass and ran across the road. To my surprise 5 baby emus appeared from the long grass in hot pursuit of their mother. 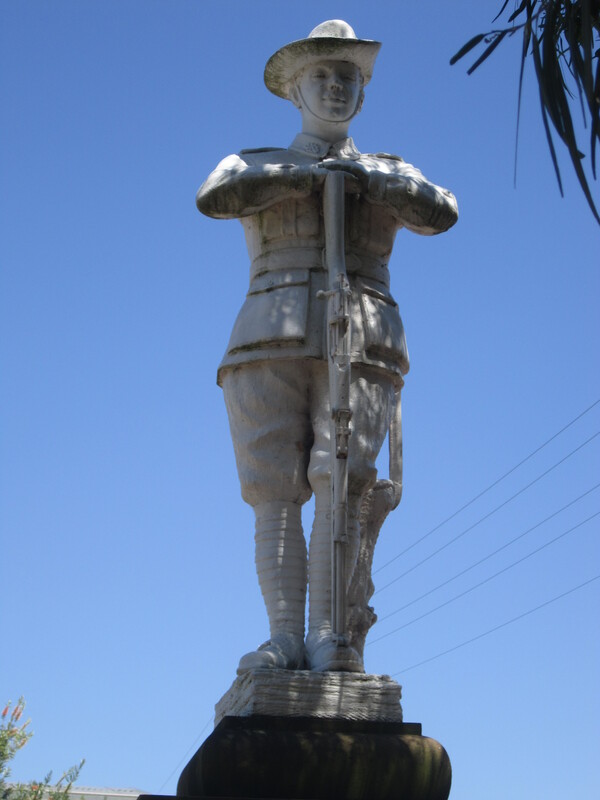 I got to Barcaldine just after midday. Being a Public Holiday not much is open but the bakery was so I got a couple of pies for my lunch. I then did a bit of a heritage trail around town visiting the main sights. Its bigger then Ilfracombe, but smaller then Longreach. 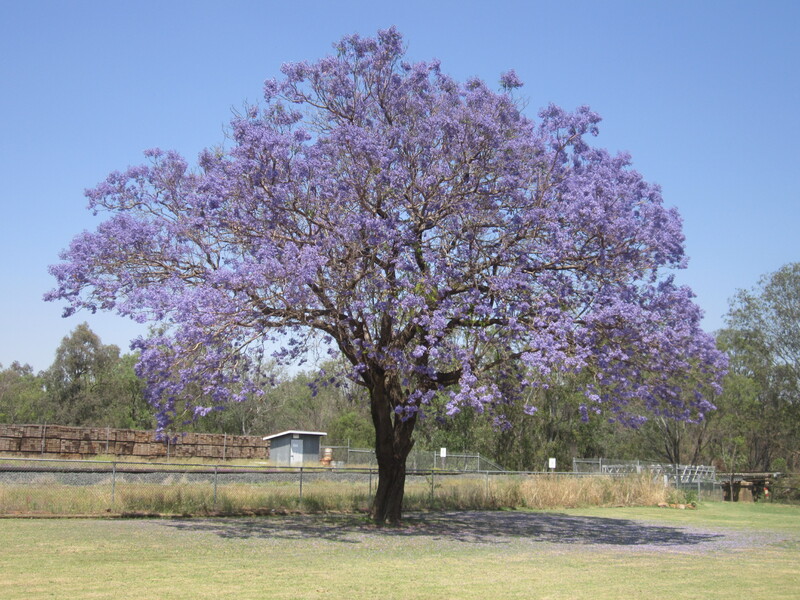 Barcaldine is famous for being the place where the Australian labour party was formed under the tree of knowledge. No longer there because someone poisoned it. I went and had a look at the church and its beautiful stained glass windows. On the way out of town I stopped and walked around the cemetary. I checked out the old part where the graves dated back to 1890. It really showed how life was tough in the old days. So many died so young. The free camping area was next to the cemetary and I set my tent up under the shelter. I had the place to myself. Apart from half a dozen magpies that were hanging around for a chocolate bisicut. I reheated the lasagne on the electric BBQ and it went down a treat. 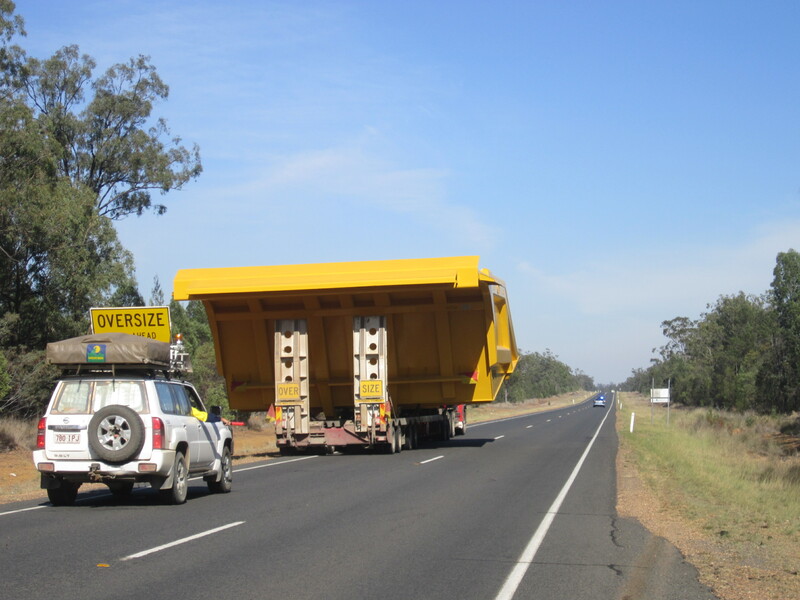 When I left Barcaldine this morning, I also left the Landsbrough highway (A2). 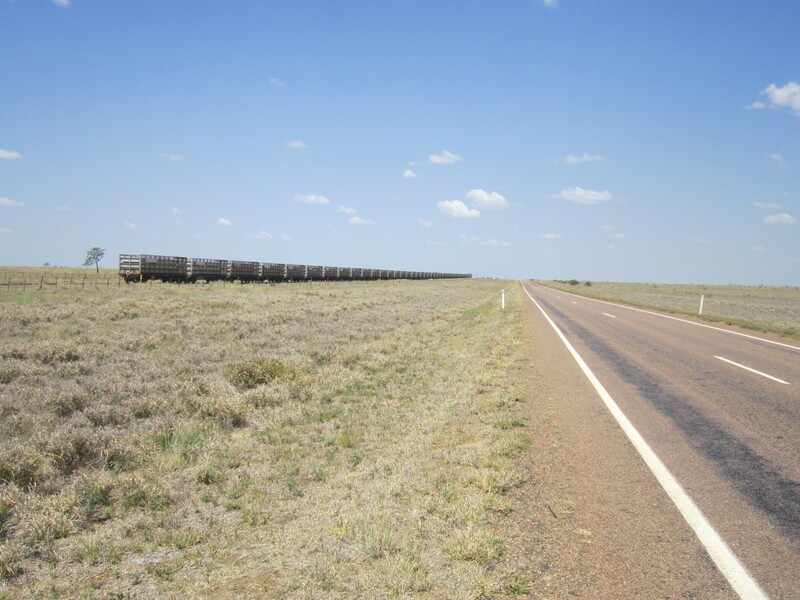 I am now on the Capricorn highway (A4) The road is pretty flat and straight. It ran parallel with the railway line for most of the day. The scenery was nice with lots of trees on either side of the road. Lots of cattle grazing the land and a few kangaroos as well. I stopped off a couple of times to see some memorials. 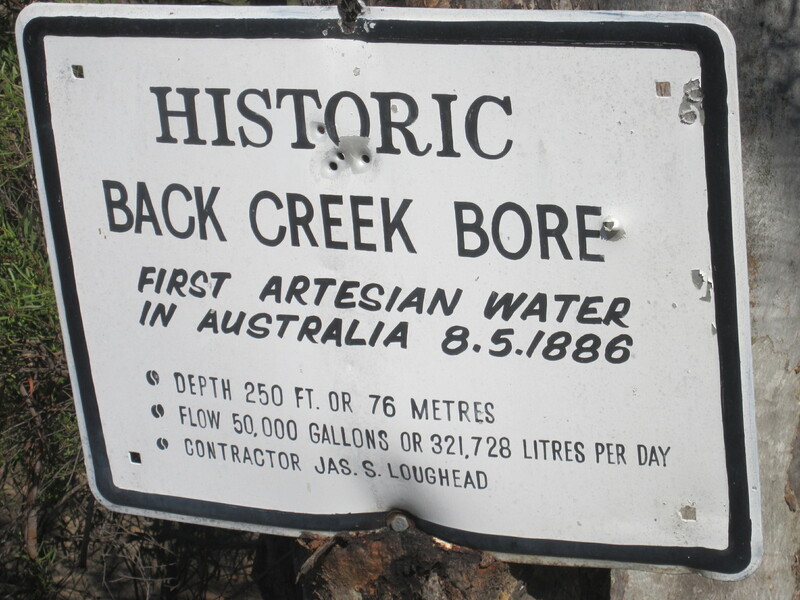 One was for the first Artisan bore drill in Queensland. I got to Jericho soon after midday. It’s only a little town. With its old buildings it has a little character. I was surprised when I saw a drive-in movie in the main street. It is the smallest in the southern hemisphere. Men in Black 3 is showing on Saturday night. 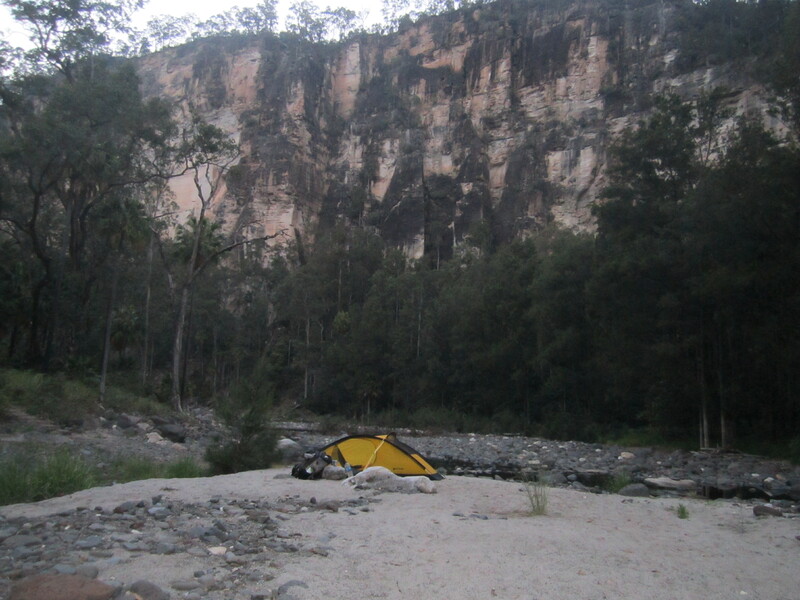 I have camped for the night in the comunity park which is on the edge of town and the river Jordon. There are a few other people camping down here as well. After collecting some firewood for later I went for a nice stroll along the river. Horses and cows are roaming. A pelican has stopped on the river and there were some very nice and colourful parrots flying around. I arrived in Alpha at 9:15 a.m. Just a little town with a few shops, a bakery and a pub. I grabbed a few pies for breakfast and sat out the front. Then there was a steady flow of campers from Jericho pulling in. They all commented how they had woken up this morning and I was long gone. I meet a Welsh couple in their 50’s who have lived in Australia nearly 30 years and are now travelling round in a caravan. They are going to free camp in Bogantungan which is 70 km and is where I am also aiming for. They have kindly invited me to join them for dinner tonight which will be somthing nice to look forward too. Leaving Alpha I had to climb up over the Drumand range. A bit of a hilly winding road flanked by lots of trees. I reached the Drumand lookout around 3 p.m. Then it was a nice 10 km downhill run to Bogantungan. A town which has had its day. All that remains is the old railway station and a few houses. There were once 28 hotels and a racecourse in the town. There are now only two residents. I met Kevin and Gale again and we camped on the little green outside the old railway station. Kevin had set up a cold shower. So I had a bit of a bush shower. I had a little wander round exploring the old railway station. It was very interesting. 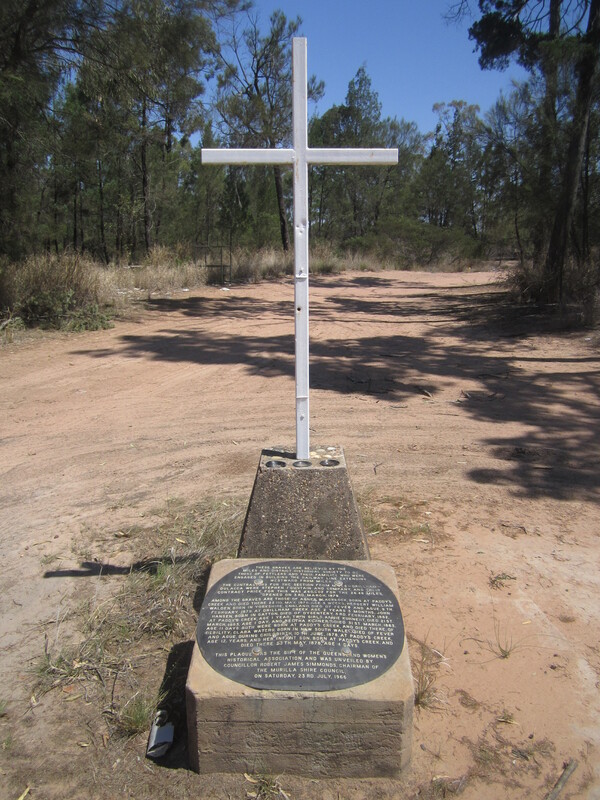 There was a memorial for the 1960 train disaster that killed 7 people when a passenger train coming down the range crashed when a bridge collapsed. 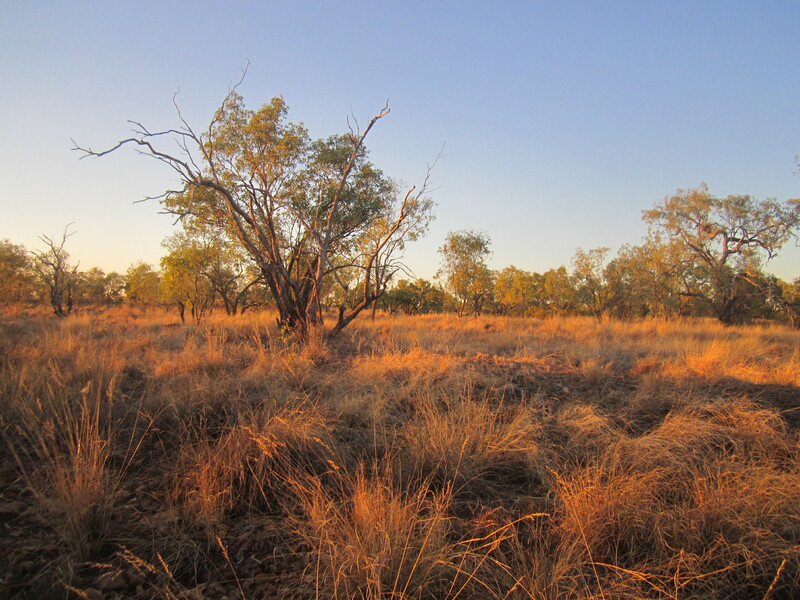 After days of long hard slogs across the outback, I am really looking forward to getting to Emerald for a bit of a break. I’m lucky because I have a friend there Rach and her partner. So after 40 something days in a tent, I will be swapping it for a nice bed. When I got to Anakie. About 45 km from Emerald, I finally got a signal again and I texted Rach to say I would be arriving in the afternoon. She said she wanted to arrange a little welcome party for me so we agreed on a 3 p.m arrival. Getting closer to Emerald there were lots of water canals and now fields and fields of farm crops. My 3 p.m. arrival went a little pear shape after I stopped to rest about 6 km from town to kill a bit of time. I didn’t want to be early. Just 2 km from Emerald I got not one but two flat tyres. The culprits were lots of little thorns. I changed the back tyre and just pumped up the front tyre again and pedalled as fast as I could as the front tyre started to deflate again. I ended up being twenty minutes late. As I cycled in Rach and about 10 friends and also a local journalist were there to welcome me to Emerald. My friend Rach is very pro active. One of the first things she said to me after I arrived was I’m taking you down to the local radio station at 8 a.m. for a live interview. My stomach just dropped…………it’s OK I’m keen to give it a go. 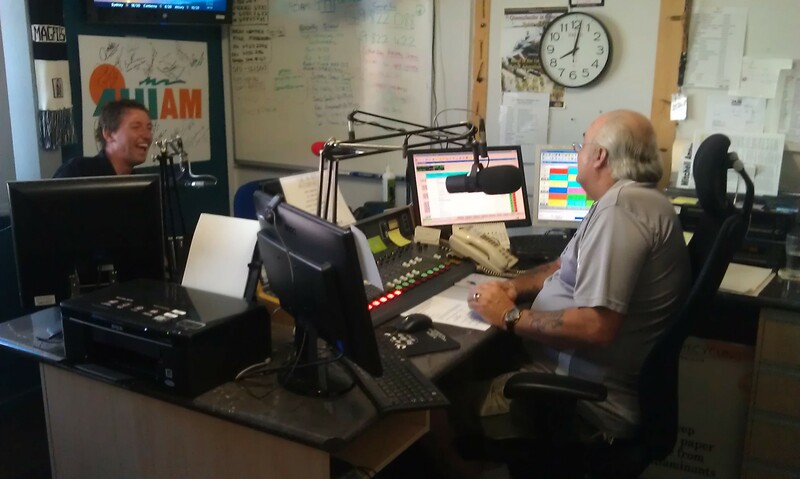 Day 554: Friday – We went down to the local radio station at 8 a.m. this morning and after the news and weather did a 5 minute interview with breakfast host Gaza. For my first ever live interview I was a little bit nervous. But I think it went OK in the end. That was enough excitement for one day. The rest of the day I just chilled which included time in the pool. 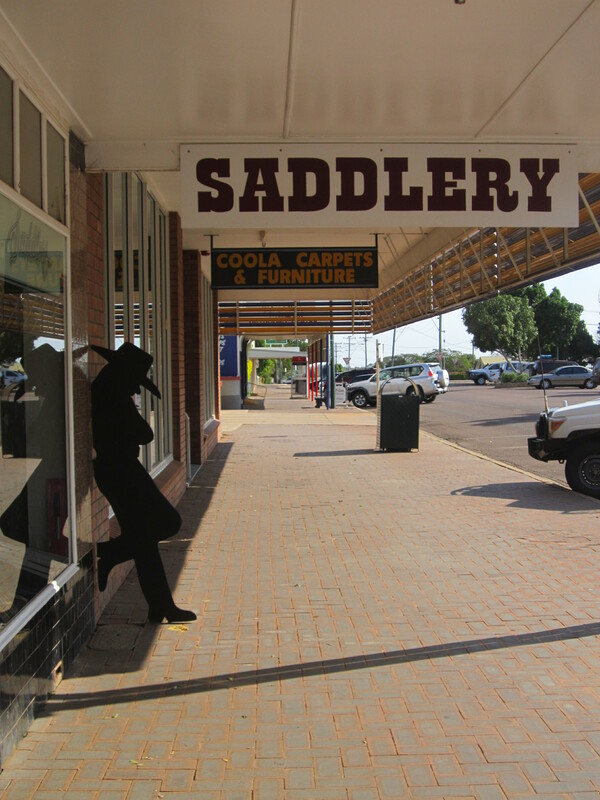 Day 556: Sunday – Emerald is in the heart of Gem county. Rach and a friend Mel took me out to Sapphire and Ruby Vale to try my luck. It was good fun sifting through some dirt with a pair of tweezers looking for gems. We didn’t really find anything so I will have to keep cycling. Day 557: Monday – Thought I’d better earn my keep so I spent the morning digging holes and planting palm trees around the pool. I also went to fix my inner tubes and found 6 punctures in each. So I have thrown them out. Will have to make a trip to the bike shop tomorrow. A reporter for the local newspaper came round and interviewed me this morning for the weekly newspaper. Day 558: Tuesday – a day of very little. Though, after 4 days I finally got my bike to the shop for repairs. Day 559: Wednesday – I asked Rach if she could cut my hair. Next minute she was taking me off for a hair cut after Rashida kindly offered to help me out. 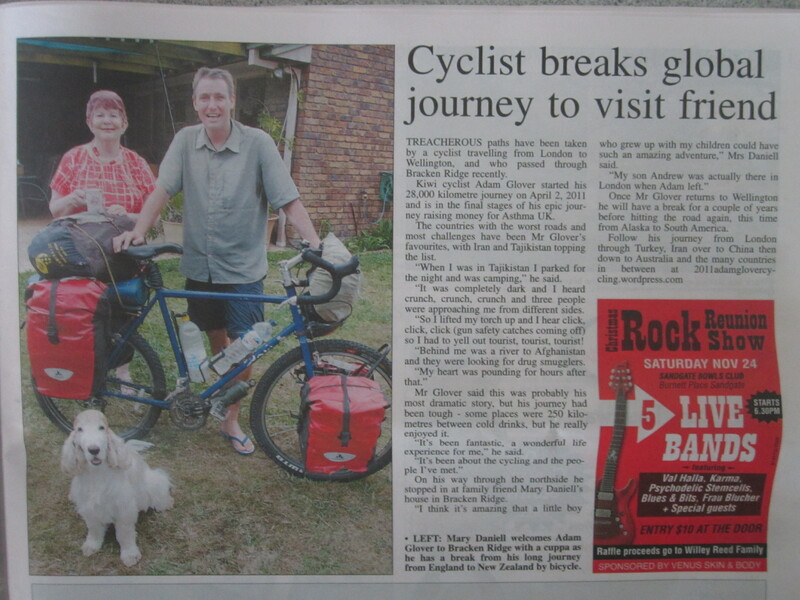 The newspaper article about my trip came out on page 5 of the local paper. I was slightly taken aback by the headline « fruity Kiwi cycles the world ». Wasn’t quite sure what all that was about. Late afternoon Rach took us out to look at the dam and afterwards I picked up the bike. So after getting the handlebars retaped and the gear cable casing replaced. I am good to go. Day 560: Thursday – Just when I am about to leave there has been a bit of a cold snap that has come in with the rain. Don’t fancy cycling in the rain at all. Like a condemned man I was able to request one of my favourite meals for my last night. Having been well rested I will be on my way tomorrow. Mark had some of his family over and cooked up a mean lasagne Luckily for me, some of which will be going with me tomorrow. After being in Emerald for a week and being spoilt rotten by Rach and Mark with bacon and eggs for breakfast everyday and lots of other very nice home-cooked meals. 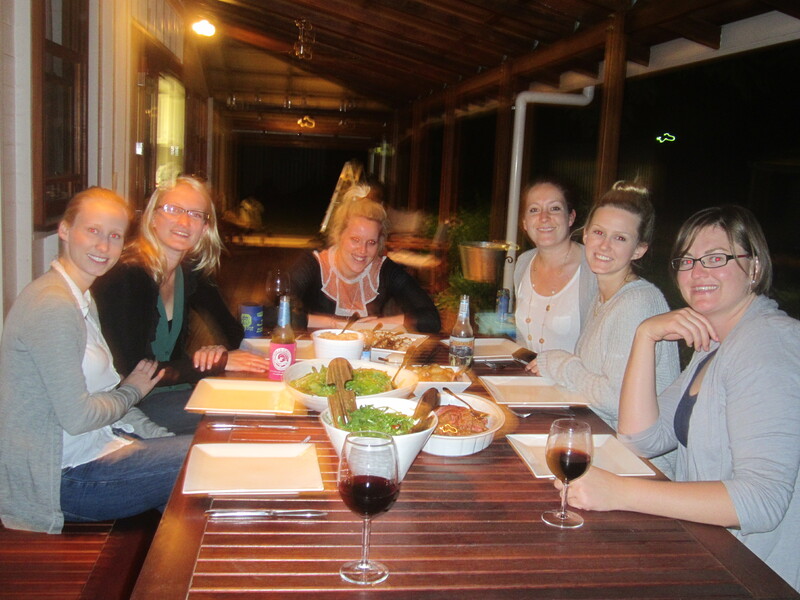 They have been truly wonderful hosts……….and Rach has been so pro-active in publicising my trip. It was very difficult to leave this morning. I was looking for any excuse like rain to stay another night. The rain from yesterday cleared and was replaced by a strong wind………so I nearly used that as an excuse to stay. Actually I had a morning appointment I needed to keep. 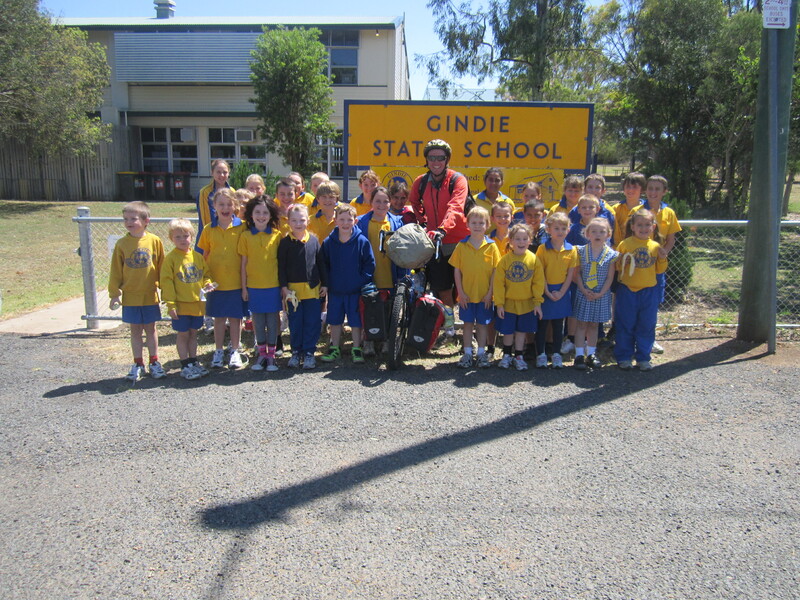 I was invited to call in to Gindie state school on the way through and give a little talk. This was another first for me this week. I think it went really well. The kids were great (two classes of about 30 students in total) -just a little country school. There weren’t too many hairy questions. Afterwards I got a great send-off with half the school coming out to the gate to send me off. By 1:30 p.m. 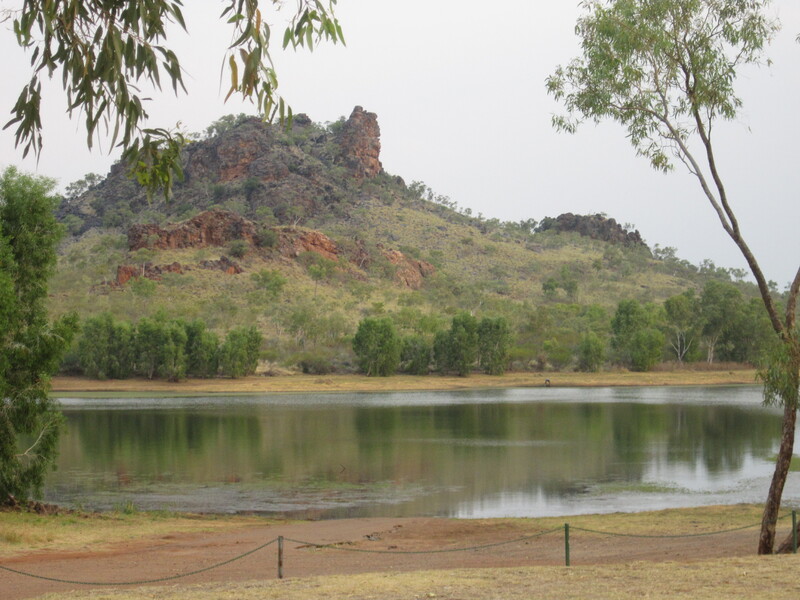 I had reached the free camping area at Springsure and that was enough for me. It’s a bit noisy here. The surrounding trees are filled with very colourful Lorikeets. I didn’t sleep that well. I could hear the flying fox bats flying around all night. It meant I was a little bit slow starting this morning. The virgin rock looked very nice with the sun shining on it. 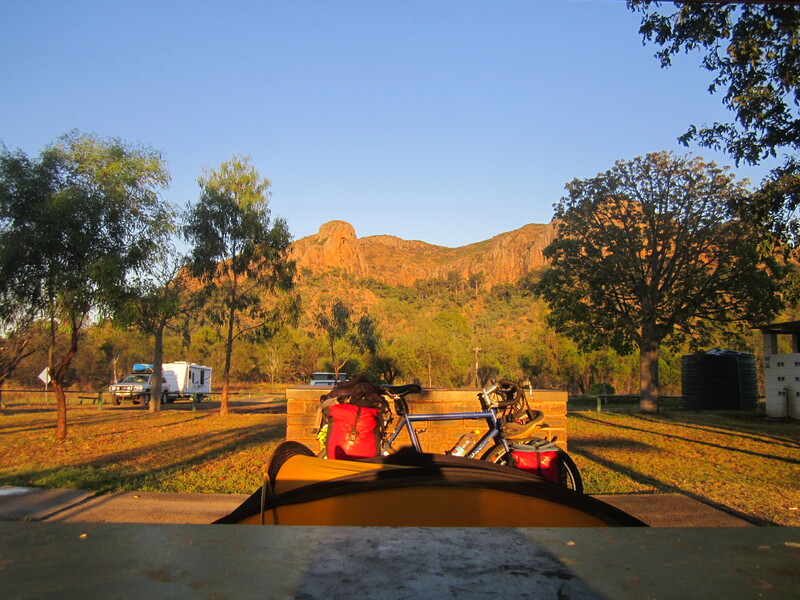 I cycled into Springsure, stopped for a burger and then had a little look around as I cycled back out. In recent days I am attracting the attention of magpies that hover above me as I cycle along. I can see their shadows. They bomb me trying to take a swipe at my helmet. The road was flanked by lots of trees, very rolling and climbed over the range. A nice view was had at the top. At the bottom of the range on the left-hand side of the road it was very lush and green. A huge contrast to the right-hand side that was very dry. In the distance I could see a number of bush fires burning. I have stopped in Rolleston for the night at the local caravan park. Not much to it. It is full of miners. They wanted $18. I negotiated $15 even that was too much. 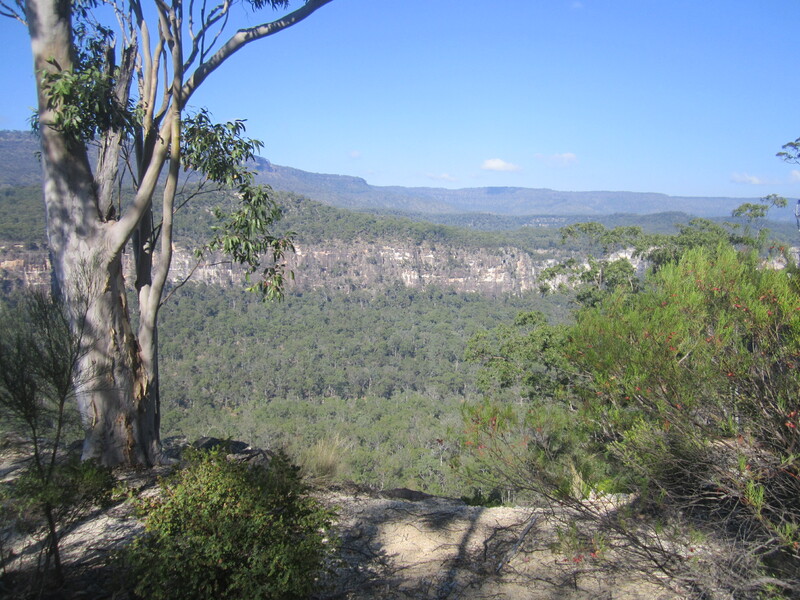 Tomorrow I will head for Carnarvon gorge………about 100 km away. 40 km of that is on a dirt road off the highway. Last night I went to the local pub to watch the Rugby league between New Zealand and Australia. The pub was full of contractors from the mine. Unfortunately I didn’t get the result I wanted. 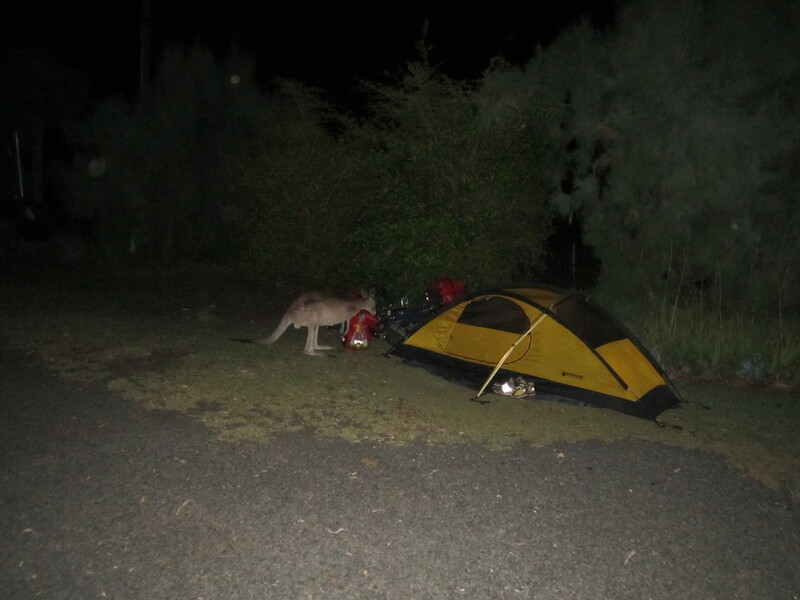 At half-time I went back to the campsite and found a bloody kangaroo trying to get into my panniers and sniffing round the tent. I tried to get rid of him and he started to chase me……….I had to run in the toilets. I finally got rid of him and went back to the pub. Then when I got back a little later I had just got in my tent and the bloody kangaroo turned up at my door again. There was a little stand off before he lost interest and headed off. This morning I watched a topdressing plane spraying the fields. To the west many bush fires could be seen. Cycling with my head down, my attention was caught when I noticed something running beside me. It turned out to be an emu. I got down to the turn-off for the gorge around midday. 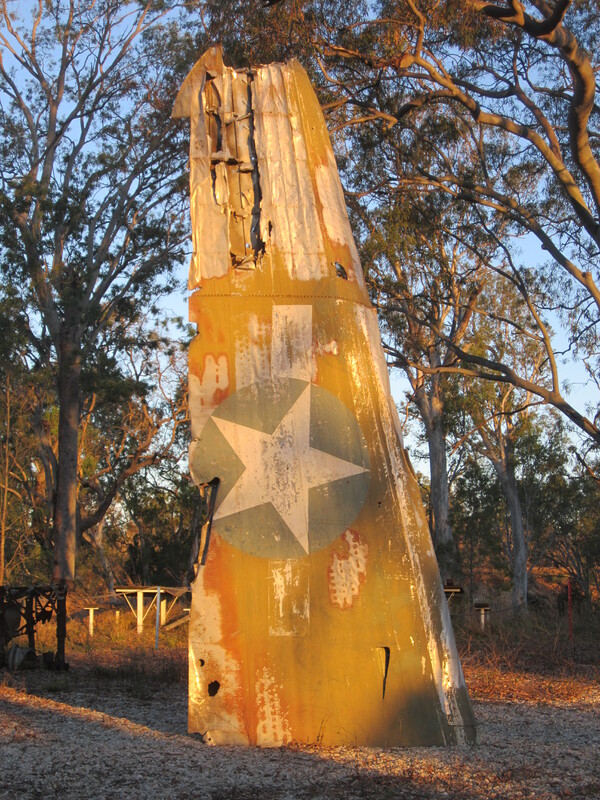 I then only cycled another 15 km before pulling up for the day at the WWII Dakota crash memorial site. If I went too much further I would have to stay in the caravan park which is more then $30 for a site. I will just camp here for free and cycle up to the park early tomorrow morning. I must have picked a good spot because two caravans later joined me. They invited me for happy hour and gave me an onion sandwich. The first thing I saw this morning when I stuck my head out of the tent were 3 wallabies looking at me. It was a cold morning. I was wishing I hadn’t thrown away my winter gloves………..but I hadn’t needed them for so long. The road up to the park office was pretty rough. There were about 3 water crossings I had to cycle through. Cycling into the park there were kangaroos everywhere. I have arranged to leave my bike at the rangers house and I plan to overnight at the end of gorge……which is about 10 km in. Along the way are some side trails to visit a few things as well. Knowing I didn’t have to walk back I just took my time. Next stop was the Amphitheatre. After climbing stairs and going through a narrow 20 meter passage you come out into a very high 3 sided chamber created by the flow of running water over millions of years. There is plenty to see in the park and to do it all would be difficult. Wards Canyon was a steep climb up a waterfall. the narrow passage at the top is home to giant ferns. 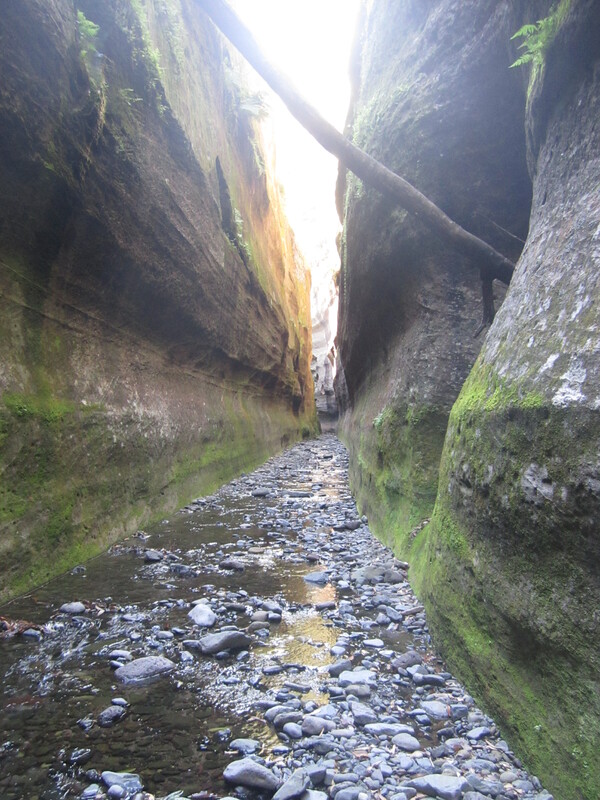 The sandstone walls have a curve left from the flowing water. 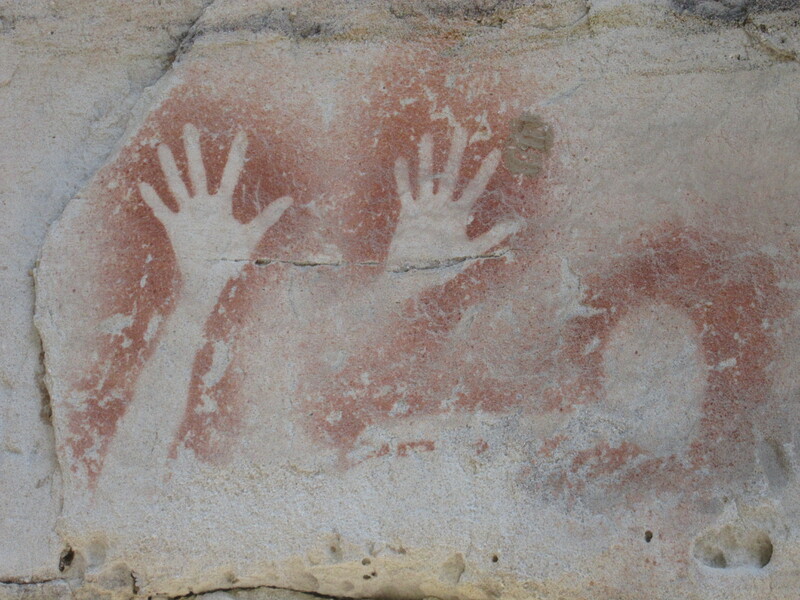 I finally got to see some aboriginal art on a 62 meter sandstone wall. It was real caveman stuff. I continued up the gorge. The sheer walls became very high and very narrow in some places the water was running from side to side and there was no way not to get wet feet. The canyon was very windy and had a curve formed by the water and the wind. The description for the trail to Big Bend, where I intended to camp the night read as follows: « May be extensively overgrown; hazards such as fallen trees and rocks likely to be present. No formed track. Rough and uneven surface ». I kept going up the canyon even though I was having to climb over rocks and trees. What worried me was that I couldn’t see any other footprints and the other thing was that I was told there were 3 people on their way back and I hadn’t seen them. I kept pushing myself saying the camp site will be just around the corner. In the end it was starting to get dark and there was nowhere to put up a tent. I could see myself having to make do and sleep out in the open. Heading back I was very tired. Trying to beat the departure of the sun, I was hurrying a little. I went over on my ankle 4 times, slipped off one rock. In the end I was still in the canyon when the sun went down. It became very eerie with complete silence. I had no choice but to keep going. Even if I could have found somewhere to put up the tent, it is too dangerous with the risk of a rock fall. I finally got back into the wider gorge. The only way to see was to walk down the middle of the river. I couldn’t see them but could hear many animals take off into the bush as I passed. About 7 p.m. I finally found a sand bank in the middle of the river. Exhausted I put my tent up, had a tin of mango pieces, some museli bars and went to bed. I had visitors all night. The first were a family of wild pigs that had a good dig and a sniff around the tent. I just ignored them. The next thing I heard was the sound of hooves as a wild horse came across the river. I was very happy this morning when the sun came up and I could see where I was. I was very lucky I hadn’t gone any further down the river because I would have missed the turn off for the track which I could now see clearly. I walked about 4 km back towards the Information Centre. 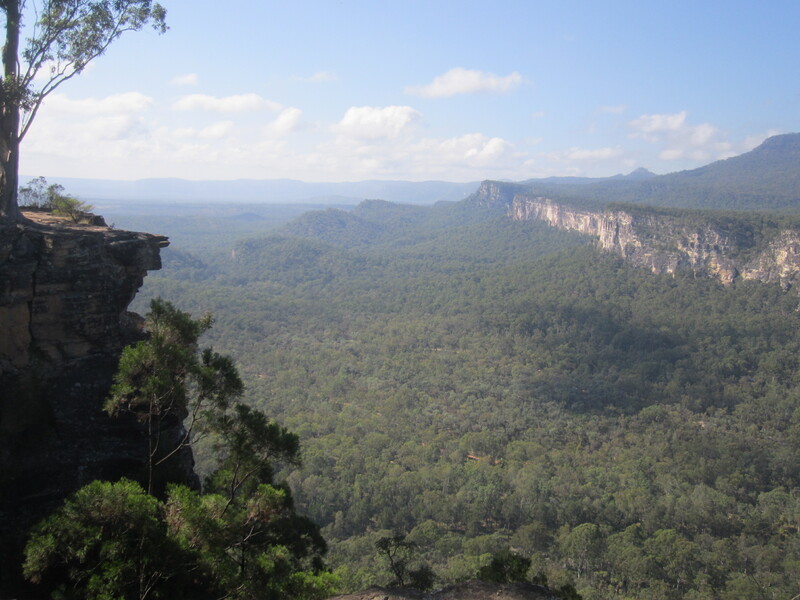 I then took a track that went up to the Bluff where you could then have a great view and also look down into the Gorge. It was a very steep climb up with lots of steps. But it was a nice walk and the view was worth it. When I got back to the park entrance I just chilled for half a day relaxing in the shade while lots of kangaroos ate the grass and also laid in the shade. Yesterday while I was cycling up to the park, I had a car stop me and the lady asked if I had cycled from London…………she explained her husband was a keen cyclist and is planning to do a similar trip. She said he would love to meet me and that after I had finished in the park I could come and stay on their cattle property for a night. I said I would be keen for that. 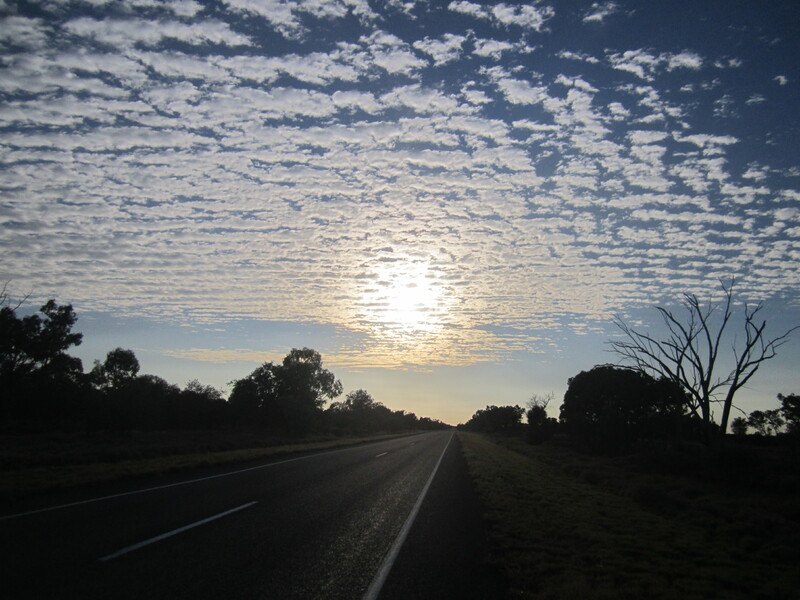 As I cycled down their driveway there were 20 – 30 kangaroos and wallabies beside the road. I met Bruce on the roan and I followed him up to the house where his wife Lucinda was. They offered me a bed in the house. But I said I was happier to just camp on the lawn. For dinner we had sausages that were made on the farm and were pretty nice. I had a good chat to Bruce about cycling. I have now decided to stay another night and have asked if I can go out Mustering with them tomorrow. I had to borrow some long pants and some work boots. At about 6:30 a.m. we saddled up the horses. 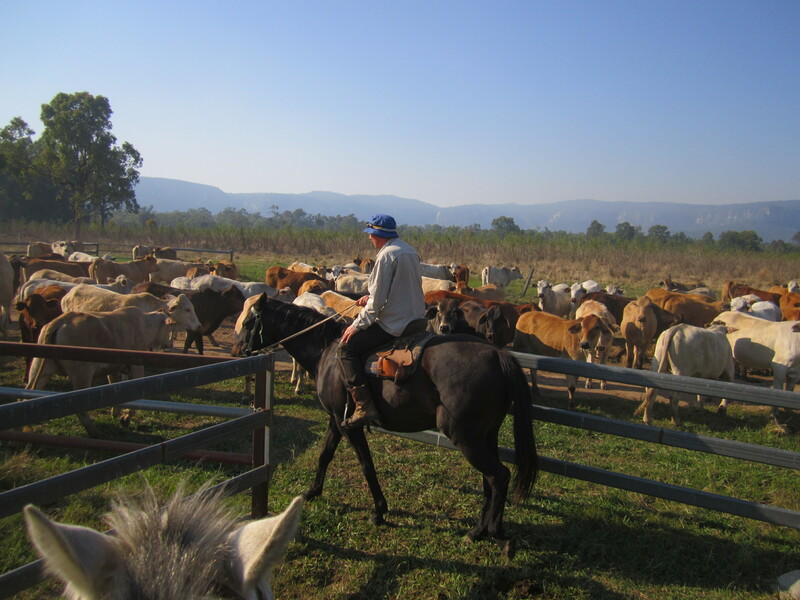 We then had to go and round up about 100 cows to be brought down to a yard by the house. We spread out and pushed all the cows up to one corner of the paddock. 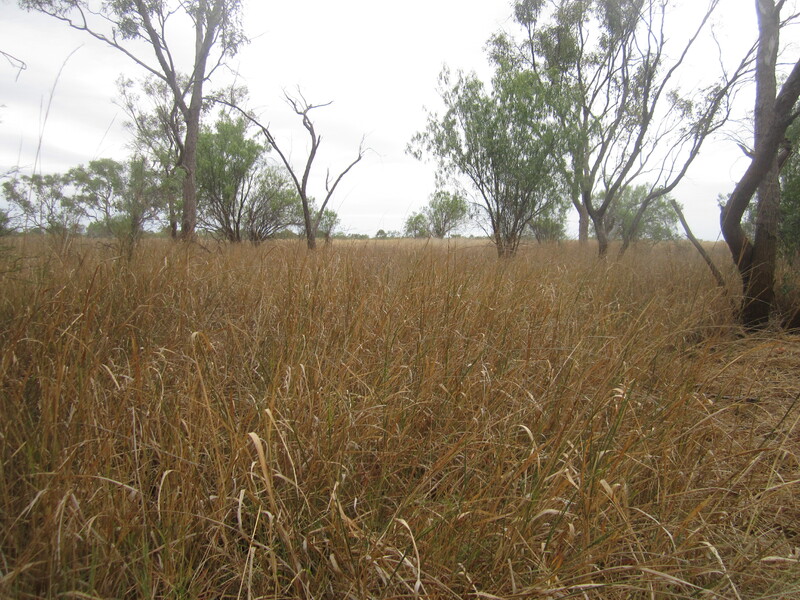 The paddock was about 1 km by 2 km wide. The cows were then pushed through a gate into a narrow 20 metre fenced channel that led up to the house. The guys got me to push the cows up to the yard while they went back out to look for 8 missing cows. It was good fun, but hard work. Twice all the cows got back past me and I had to start again. Once one cow gets past you it creates a stampede and they all go. Thankfully in the end I managed to get all the cows up to the yard. In the afternoon Bruce took me to his son’s farm where they are at present harvesting chickpeas for India. 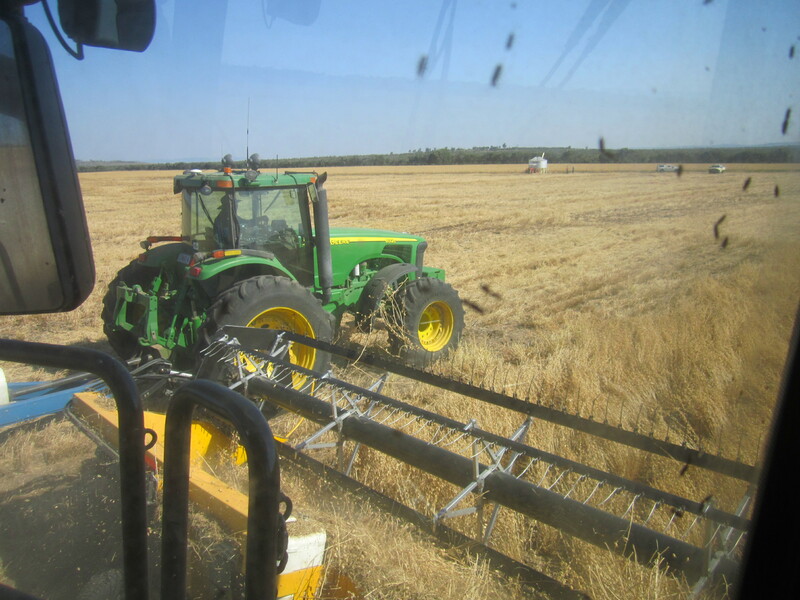 I got to go for a ride in the harvester and the tractor. Both of which have GPS and drive themselves. The harvester was pretty big cutting 12 metres at a time. Not all the chickpeas make it to the bins. We were eating a few off the ground that didn’t make it. On the way back I saw a bearded turkey for the first time. 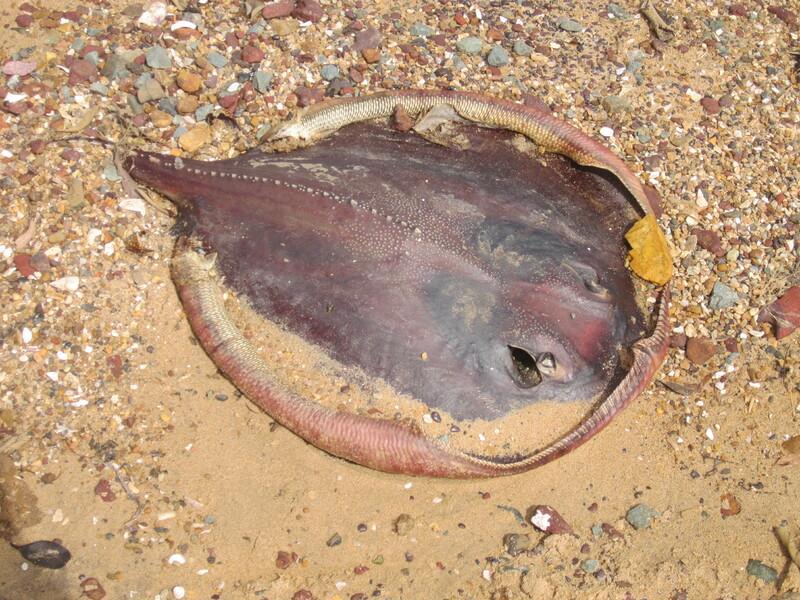 It has a massive piece of skin hanging down from its chin. It looks like all the meat eaten on the farm comes from the farm. For dinner tonight we had corned beef which also came from the farm and was very nice. Lucinda has kindly arranged for me to stay at her parents house which is in the next town, 150 km away. Don’t fancy doing that in one day so I have only cycled 65 km today and will visit them tomorrow. Tonight I am camped at a free rest stop next to a river. It is a very nice spot with the cows watching me from the other side of the river. Bruce and Simon went to Injune earlier in the day and on their way back they stopped off to see me and had a nice cold bottle of coke. I hit the range straight up this morning. It was steep. But not for too long and then it was a good steady downhill stretch all the way in to Injune. Along the way were lots of signs giving directions to the many coal seam gas sights off the highway. There was much smoke around from the bush fires as well. From eleven o’clock onwards it was stinking hot at about 38 degrees so cycling in to Injune at midday was a good time to stop. Like a lot of towns, the railway line use to run through it. All that remained was an old station and an old steam locomotive engine. I have another contact for tonight. Lucinda kindly told her parents Rita and Robert that I would be passing so I was able to go round and put my tent in their backyard. They usedto be farmers and Robert showed me his collection of Aborigine stone tools he had found on his farm as well as a spear, boomarang and club. He also showed me his gold nuggets he had found with his $6000 metal detector. The most interesting thing he showed me was an old Colidine lamp. It was like a science lesson. The Colidine rock is placed in the lamp. Simply by adding water the rock reacts creating a gas which is then burnt producing a very bright light. Like any town I like to have a little wander around – its such a shame to see how many small shops have had to close up. I have been well spoilt in recent days. Rita and Robert were great hosts. After a good breakfast, I departed with some corned beef sandwiches for later in the day. On the way out of town I stopped at the old cemetery. Some of the graves showed that some of the early pioneers were from Germany and America. Close to the road were a couple of rundown homesteads that were worth taking a photo of. On the way into Roma I called into the showgrounds. Only $11 so I was going to stay there. Next door the races were on as well so I thought I would be checking them out later in the day. But first I wanted to get to the suppermarket and stock up for the final 500 odd km to Brisbane. Important to shop today because being Sunday tomorrow Woolworths will not be open. As I went down the main, but now very empty street of Roma, I stopped and asked a guy for directions for Woolies. He introduced himself as Ben a local journalist and asked if he could interview me later in the day. I said no problem. He invited me for a beer in the pub we were standing outside of. I couldn’t say no. On such a hot day it went down too well………….gone in 30 seconds. On the way in a local guy was asking me about my trip and he sent the second beer over. He later came over and said I was more than welcome to come and stay on his property just out of town. I would have but Ben had already offered for me to camp at the back of his flat. I think I am going to start spending more time in country pubs. I put my tent up in the yard. Had to put the fly on and peg the tent down because there was a bit of thunder and lightning around. We had to move the BBQ inside. It was another good feed. Ben did well. I got to watch some more rugby with the All Blacks v Australia game. What a result 18 all. We did the interview and Ben was blown away when I told him I had cycled from London. He thought I had just come from Darwin. He has now asked if he can do a feature article on my trip for anAustralian adventure magazine………which I am more than happy for. 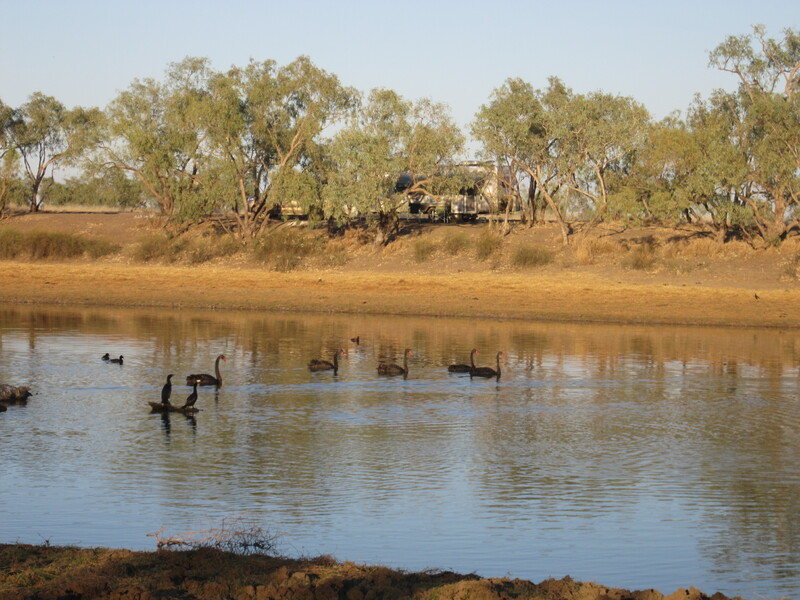 I heard about a nice camping spot at Yuleba only 65 km away from the info centre at Injune. So that is where I will head. About half-way was Wallumbilla. Just a small town. 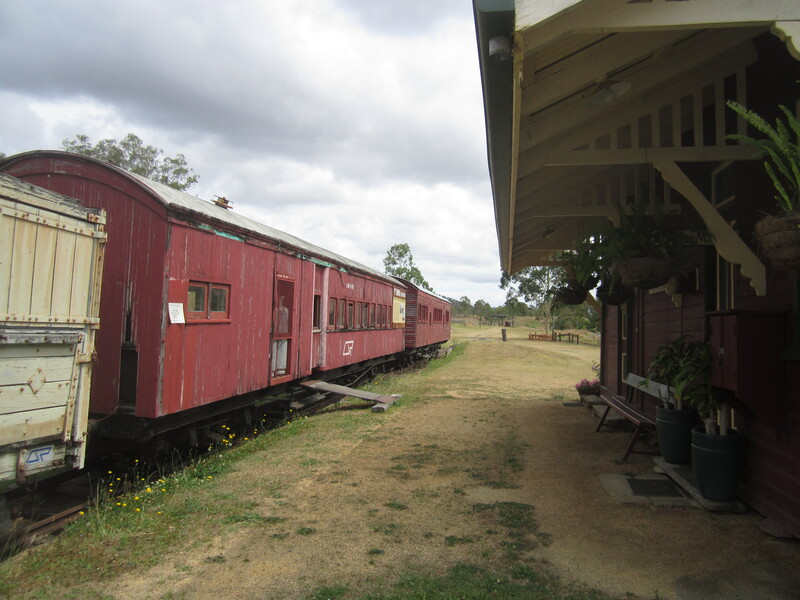 I called into the heritage centre and had a look at the railway museum which was mostly about the 1950s head-on crash that killed 5 people. Reaching Yuleba the only thing open was the roadhouse and I went in for a nice cold drink before heading down to Judds Lagoon. Here I pitched my tent a short distance from the lagoon under some trees. There are many birds around. I collected some firewood so I could use the BBQ to boil some water for a cup of tea. During the afternoon a few locals came down for a swim. Ben came out just before sunset and had me back on my bike so he could take some nice photos for the paper. The article will be printed on Tuesday. Rob was a good man and brought me out some dinner as well which saved me having to cook. Last night I sat and watched as a thunder and lightning storm got closer and closer. It got to the point when I had to put the fly on the tent and peg it down because it soon got very windy and the rain came as well. It was a good storm and I was a little worried as I lay in the tent although within a few hours it had passed. It was so nice not having to hurry off this morning. Instead I have been able to relax and enjoy the beautiful surroundings. I lay on the grass and watched the ducks swim and a small sparrow chasing blackbirds while pecking at their heads. 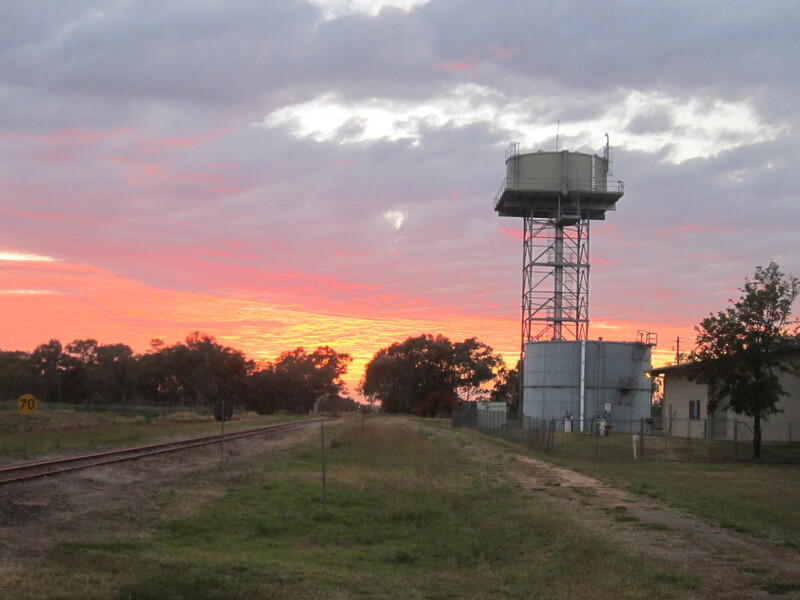 Around lunchtime I needed to cycle back into Yuleba to get some more water. Didn’t fancy drinking lagoon water. With no daylight saving in Queensland, it is getting light just before 5 a.m. and I was up shortly after that. The morning starts pretty chilly. I cycled about 25 km straight off before reaching Jackson which is a town marked on my map. But when I got there it was like a lot of towns now. 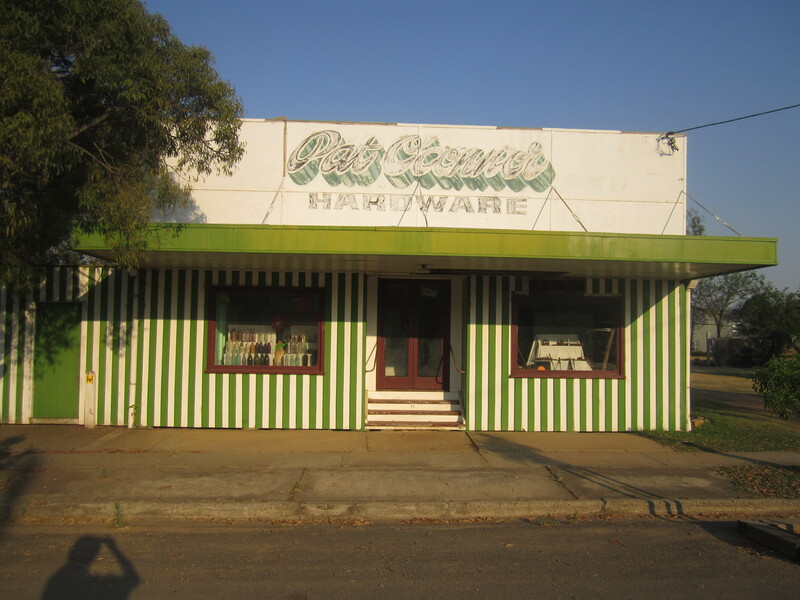 After once being a very busy town with schools, pubs, post office, general store, Police station and jail, it is now deserted with not one single business remaining. There was a nice rest area for tourists with a very informative information board of Jackson’s past history. I passed a number of small towns with similar situations. I stopped in Drillham and at the picnic area used the electric BBQ to make a cuppa. 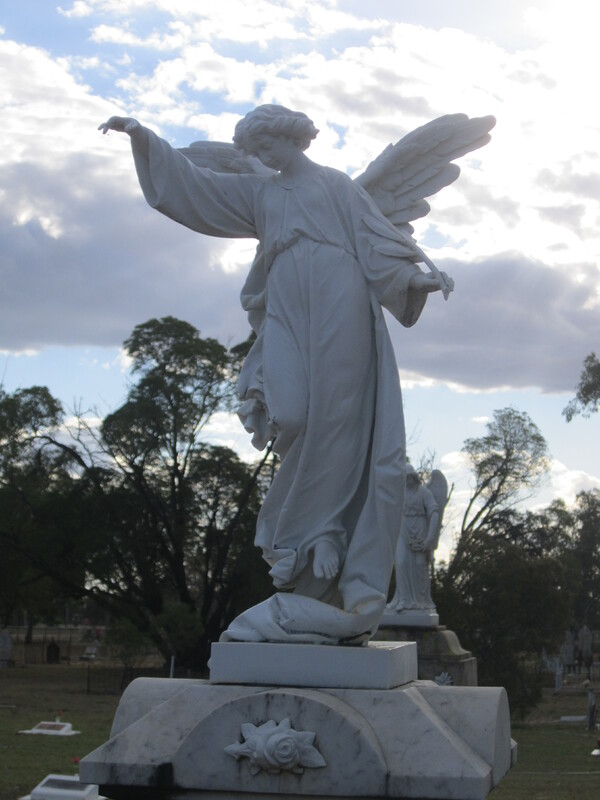 The next town had some graves on the side of the road and belonged to 4 young children who were the sons of a railwayman and all tragically drowned in a weir back in the 1850’s. There were more graves next to the railway line and belonged to people involved in the construction of the railway line. 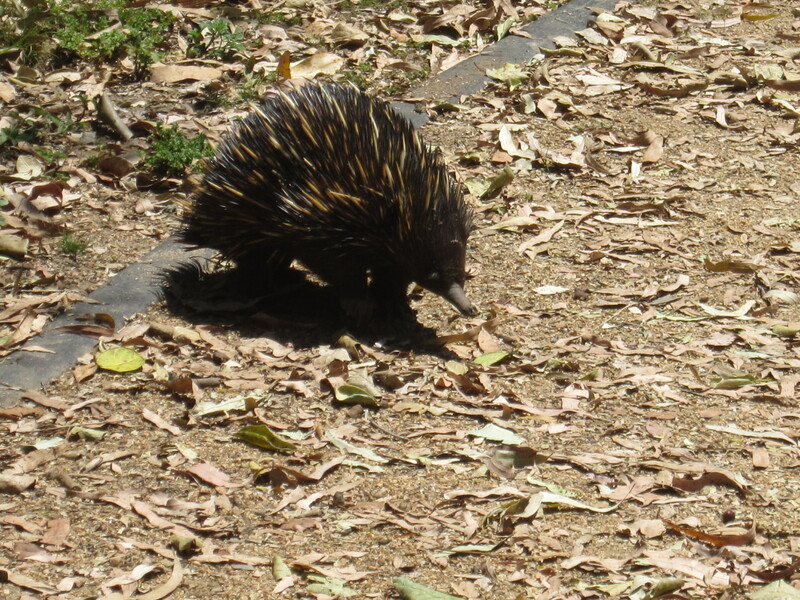 I was pretty much passed less than half a metre what looked like a big brown snake curled up and sunbathing on the hot asphalt on the hard shoulder. I wasn’t going back to check it out. I did at first think about going back to take a photo……….. but I thought better of it. Brown snakes are poisonous and I wasn’t going to push my luck. Miles is a medium size town. I called in to the supermarket and then went across to the park in the centre of town and used their electric BBQ. 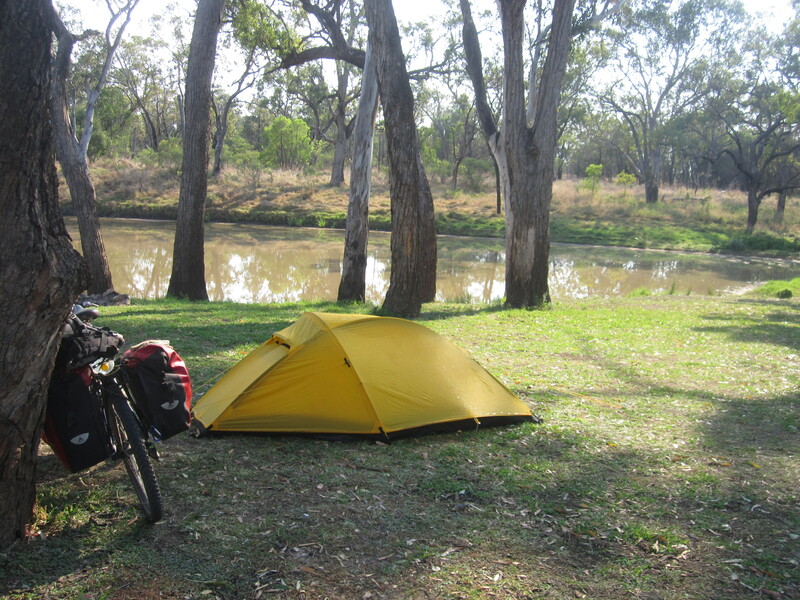 I then cycled back 1 km to the edge of town and camped down by the river. I am changing my route slightly. I have left the Warrego highway and am now going to take the quieter Wondai Road to Jandowae on the way to Bunya National Park. 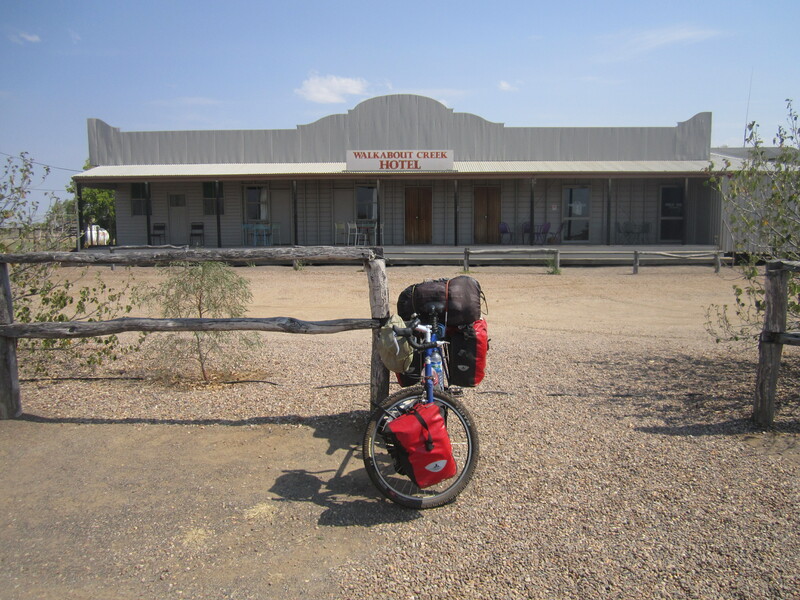 Then at about 5 o’clock I cycled 5 km out to the Round waterhole and that is where I camped tonight. Again there were lots of nice birds about. 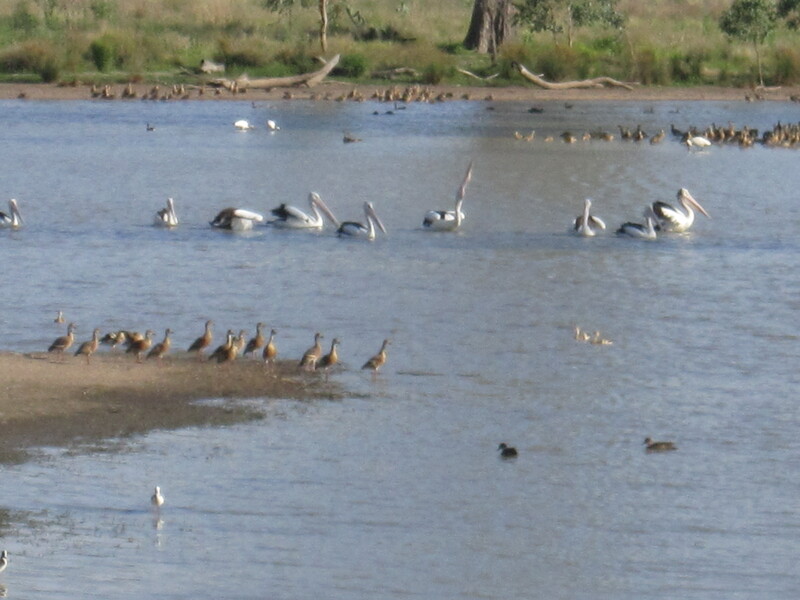 In the past two days I have passed through a dozen towns which simply no longer exist……perhaps just a few stumps on which buildings used to sit upon and are remembered by a simple sign indicating locality of…………….. in the instance of Pelican. It was soon clear why it had once had this name because as I passed the large watering hole I could see at least 30 pelicans swimming. I am so glad I have come off the main highway. It has been very scenic as I have gradually climbed and with less traffic there is more of a country feel. Jandowae is proving to be a nice little town as well. Lots of old buildings and lots of history. Free internet at the library so I am making the most of it. I haven’t had a proper wash for 4 days and was going to stay at the showgrounds. But after going down to check it out and finding that there are toilets but no showers, I will now just pick a local park to camp in and save $10. At 6 a.m. this morning I met Nancy a reporter for the local Dalby paper who was put onto me by Ben who interviewed me for the Western star in Roma. I have now done 3 interviews for local papers in Australia. The interview went well and by 7:30 a.m. I was on the move. Nancy mentioned that last night she had been at a dinner with cyclists which formed part of the tour de Curie and that they were heading my way and that I might run into them later in the day. 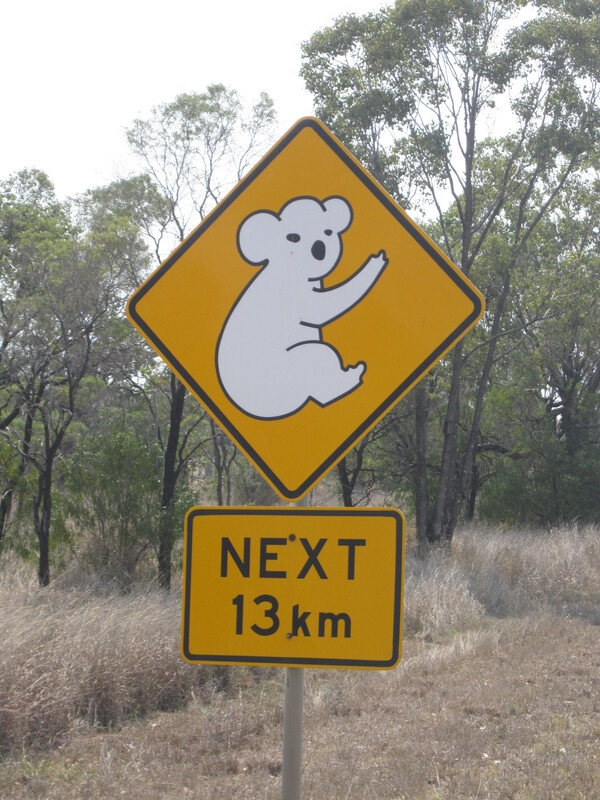 Once I hit the Bunya Highway, I thought they would pass me. 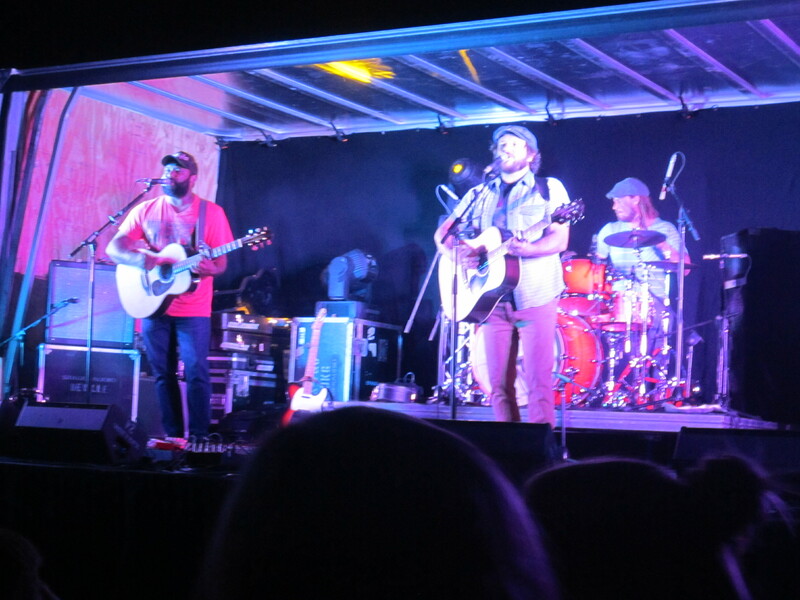 Having not seen them I turned off for Bunya Mountain National park and thought that would be that. But a short way into the park I saw two catering trucks on the side of the road and figured that was probably for Marie Curie and would be the cyclists’ lunch stop. I was tempted to stop but kept on going. 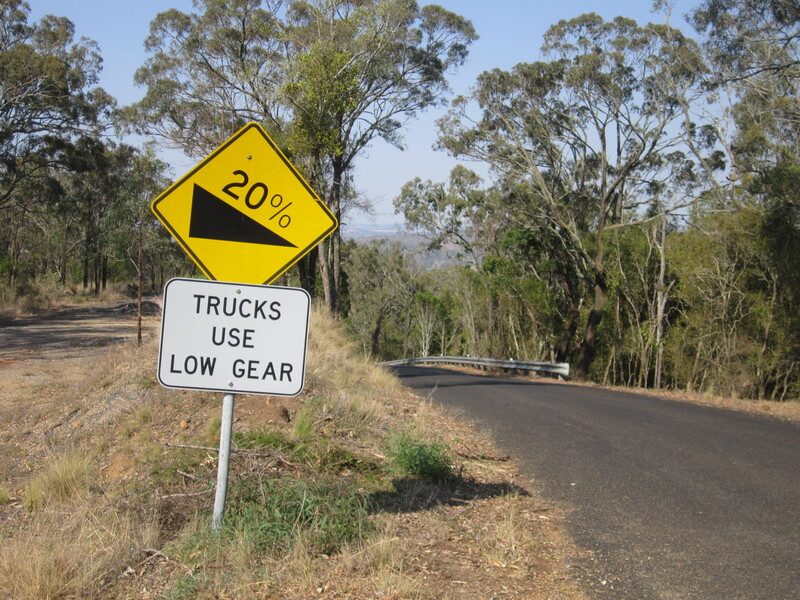 The road was so steep with a 20% gradient. As soon as it leveled off I stopped for a break and a bit of lunch. Often I have no service for my mobile, so I keep it switched off otherwise it kills the battery while it constantly looks for a connection. I just happened to put my phone on and I had one service and 2 messages. 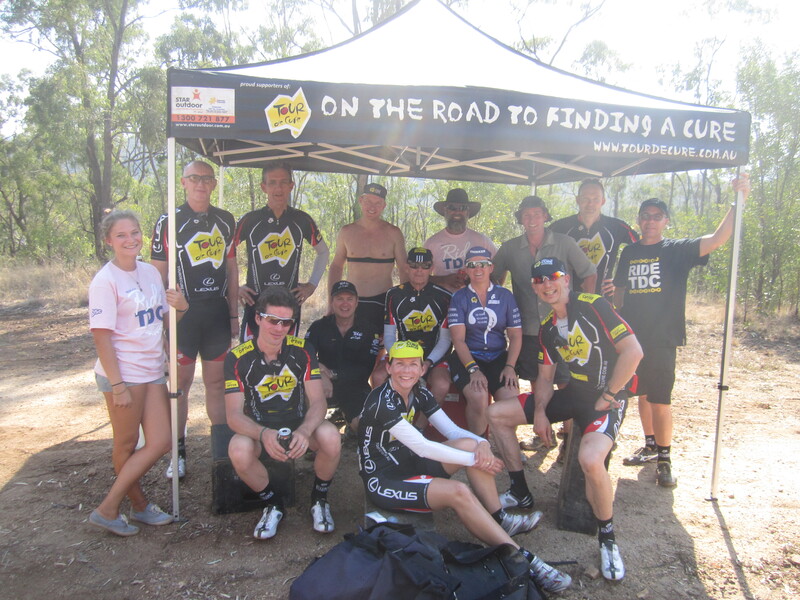 I had a message from Lynda, one of the support crew for the tour de Curie. She just happened to be giving an interview to Nancy the reporter I met earlier this morning. Nancy mentioned she had interviewed me and what I was doing. Lynda said straight away………I know that guy. It is such a small world. I worked with Lynda 10 years ago in Europe and we have been in contact through FaceBook. I had no idea she was part of the tour de Curie. Anyway to cut the story short – the message read « Hey Adam I think we may run into you today and you are more than welcome to join us for lunch ». What luck…………..it was now nearly 2 p.m. so I thought maybe they had already passed through so I called Lynda and she texted back……… « yes those are our catering trucks……….go back if you u want. Will be there soon ». I was definitely keen to go back. But there was no way I was going back down that hill after just cycling up. So I waited for Lynda to come pass in the car. It was great to see her. I left my bike on the side of the road and got a lift back a couple of kms. 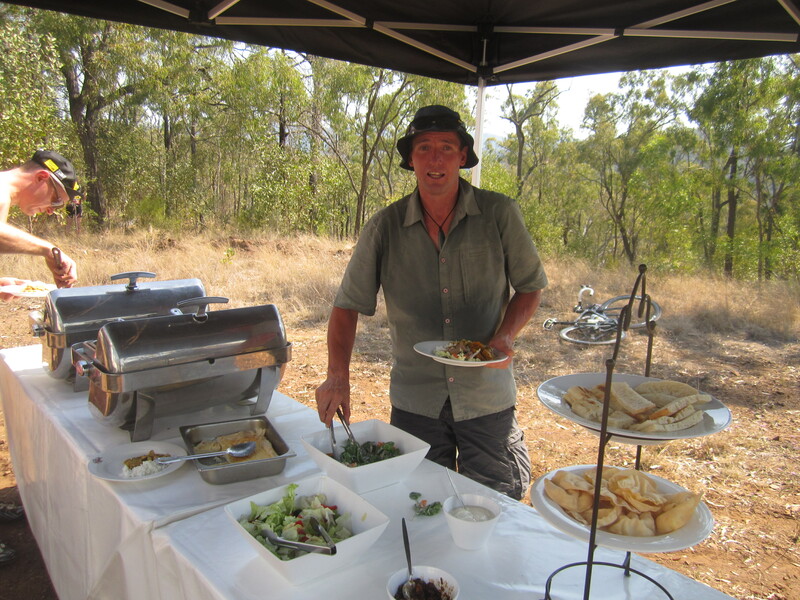 I was treated to a very flash lunch – chicken curry, salads, beef and vegetables, cakes and fruit. I enjoyed talking to the cyclists. The tour has raised about 8 million dollars in the last 7 years for cancer. I was feeling a little under done with my £1000 for Asthma. which meant you had to light a fire under a boiler. 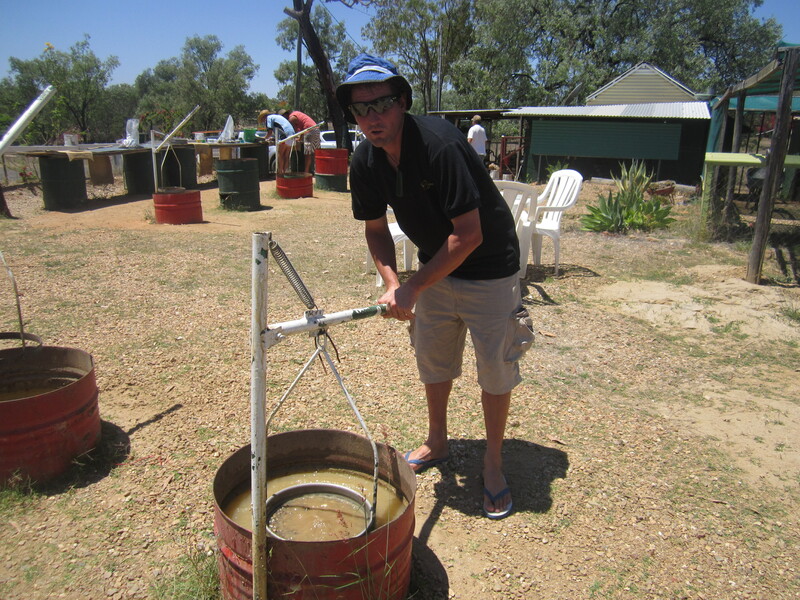 When the water was hot you then had to put it in a bucket, carry it to the shower and put it in the recipient which you then had to hoist up. You then got to stand under a fantastically hot shower. It was good fun doing it and I felt a lot better for it. I met an Irish couple – well brother and sister, Irine and Shane who were travelling around in a camper van. They invited me up for a beer and I ended up having some spaghetti bolognese with them as well. I was well spoilt today. Day 575: Saturday Yesterday’s steep hill climb must have really taken it out of me because this morning I was pretty tired when I got up. I set off straight away and did the short 1.4 km hike to the top of the 1135 metre Mt Klangarow. You could see for miles from the top over the forest and back down to the flat farm lands. I did Mt Klangarow before breakfast. After breakfast I went on a 8.4 km loop through the nice rainforest and as the trail descended the rainforest was replaced by Eucalyptus and gum trees. I saw a big python curled up beside the road on the way. I flew round the loop. I was back at the campground by 11 a.m. Had a cup of tea with Irine and Shane and since we had all done all the walks at this end of the park that we would go up to the main part of the park in the afternoon and do some more trails. I was planning to do them tomorrow but with the extra time I thought I might as well keep going which was just as well because the weather the next day was really bad. 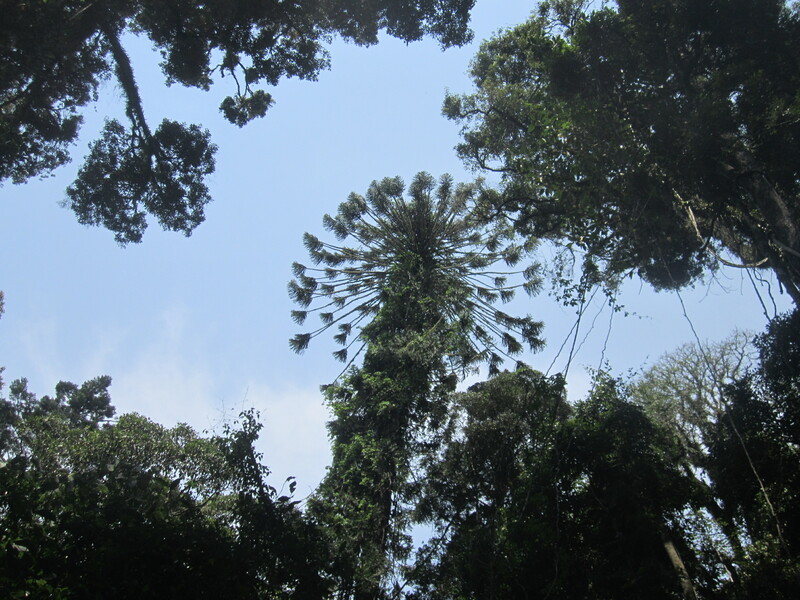 The afternoon walk was a 9km loop through the rainforest which is famous for its Bunya pines. 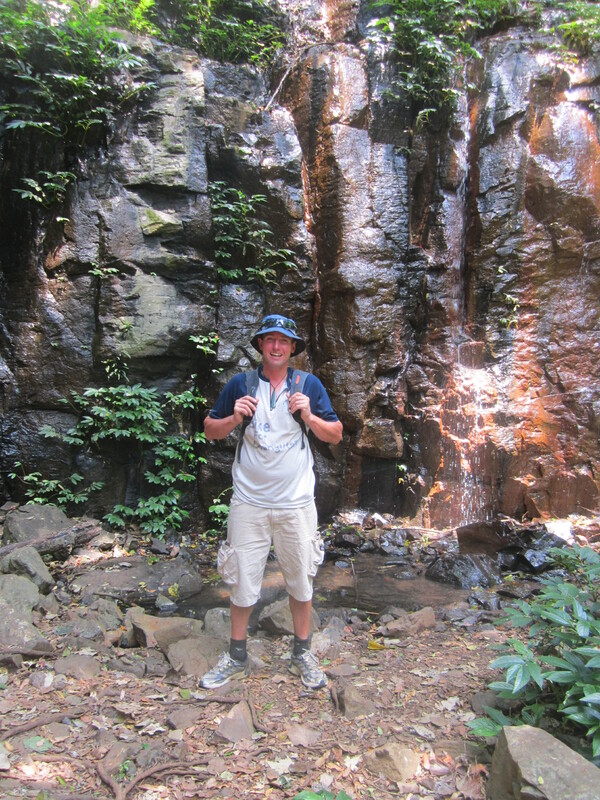 The trail went past a few waterfalls and out to a few lookouts. In the late afternoon the weather changed. It started to rain a bit and it got cold. We had to all rug up in fleeces and hats. While drinking tea with Shane and Irine at the back of their camper van we had an awesome little visitor when an owl landed just behind us. 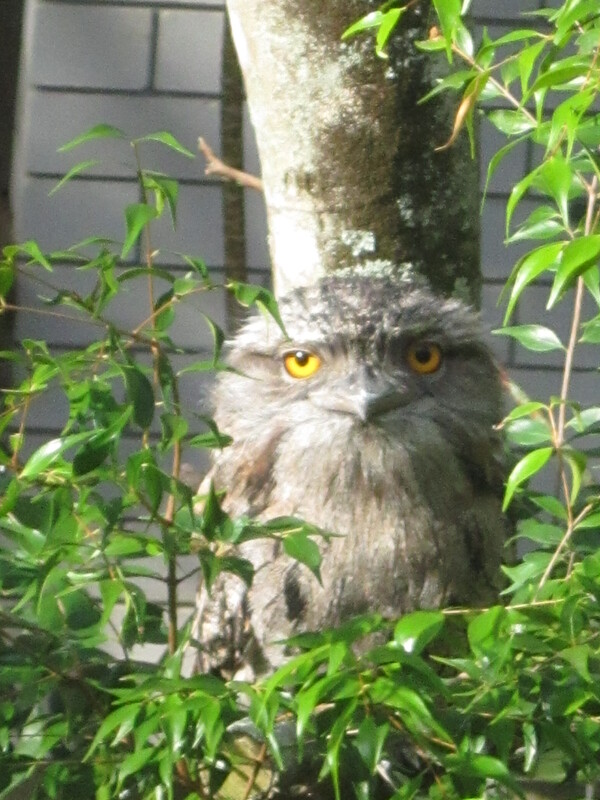 Earlier in the day I had another visitor which was not so nice. Coming back from the shower I saw a magpie sitting on the picnic table next to my bike. I then saw it take off with my apple I had silly left out. He could have had an orange……but chose the apple. Day 576: Sunday – what a miserable day. I woke up and everything was covered in mist, I fired up the donkey. Had some breakfast, a cup of tea with Shane and Irine before they left and then a nice hot shower before going back to bed. I had a day chilling in the tent while listening to the rain and my trustie shortwave radio. It was another cold misty damp morning when I appeared from the tent. A hot cup of tea was needed so the fire went on. I got away about 7 a.m. 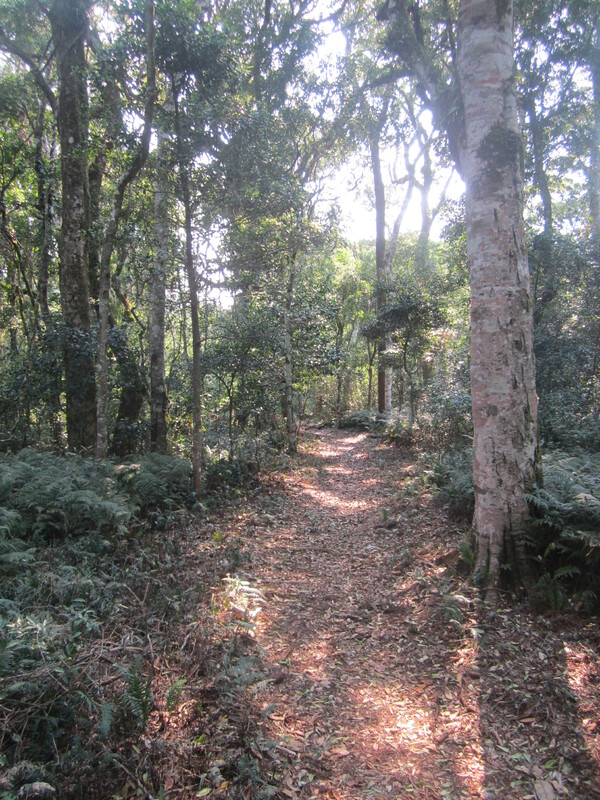 The first 10 km were up and down as I travelled along the top of the range while flanked by the rainforest. There were many, many wallabies about. It was steep coming up and it was just as steep going down I had a good 25 km stretch on which I hardly had to pedal. 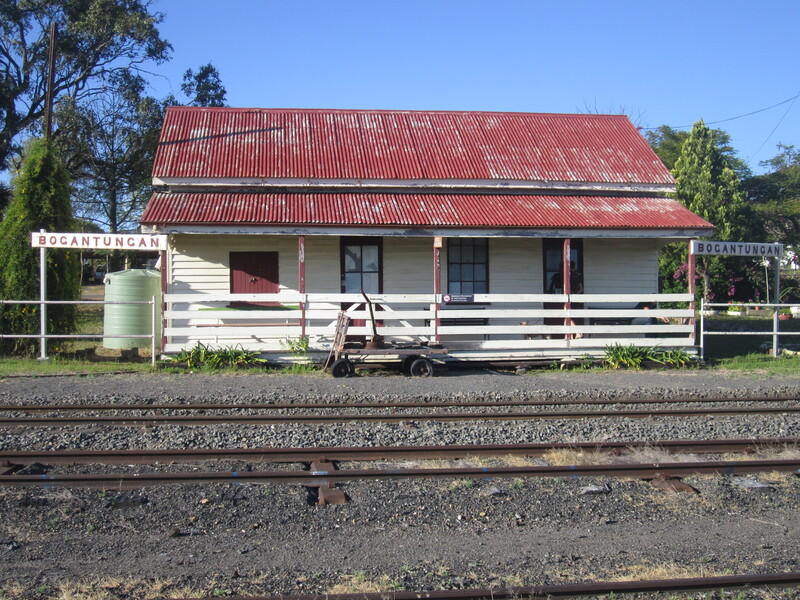 I eventually came out on the New England High and took the road to Yarraman. 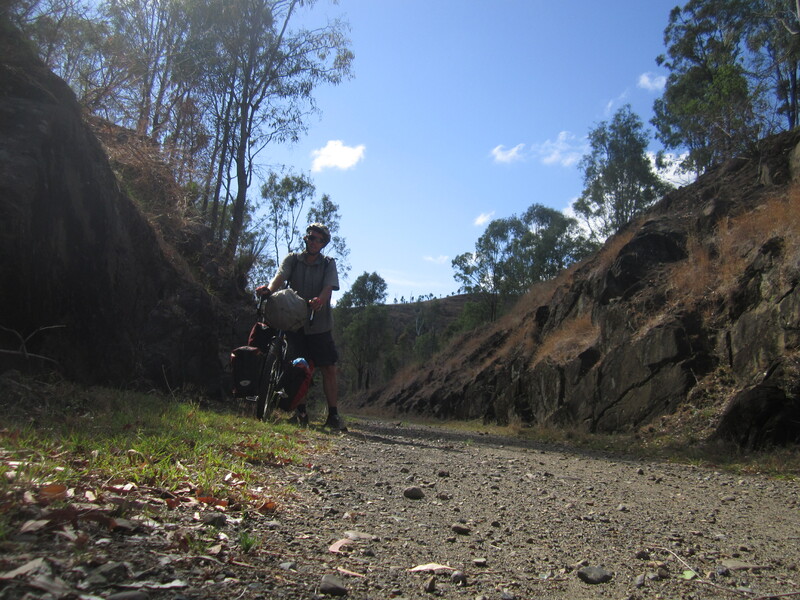 Here I left the road for the Brisbane Valley Rail Trail. An old railway line built in the early 1900’s. In total, I will probably cycle about 55 km of the trail. It was good to be off the road and away from traffic. The trail passed through farmland full of cows, as well as forests and old stations that were now only evident by a sign. At the old Benarkin station there is now a picnic area so I have pulled off the trail to camp for the night. This morning I continued on the Brisbane Valley Rail Trail for another 25 km and it was beautiful. It was all downhill as we came down Australia’s Great Dividing Range. It was well-shaded as we carved through the forest. Reaching the small town of Linville it was interesting to look around the old train carriages. There was a first- class carriage with a flash ceiling and lampshades. The station has been restored and looked good with its fresh coat of paint. Moore marked the end of the trail and I had to get on to the D’Aguilar Highway. 33 km of that was enough for today. It wasn’t much fun with lots of traffic. 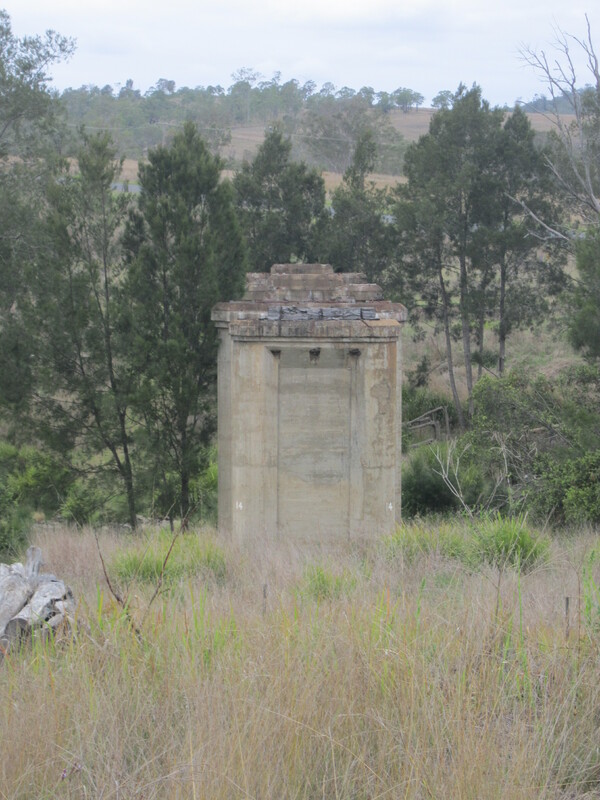 At Kilcoy I took a backroad firstly past some dams and then through some very scenic farmland on a much quieter road. The ride was slightly spoilt with puncture No. 45. Tonight I have camped at the free rest area just 60 km from the coast. For the first time in two months I should get to see the ocean again. 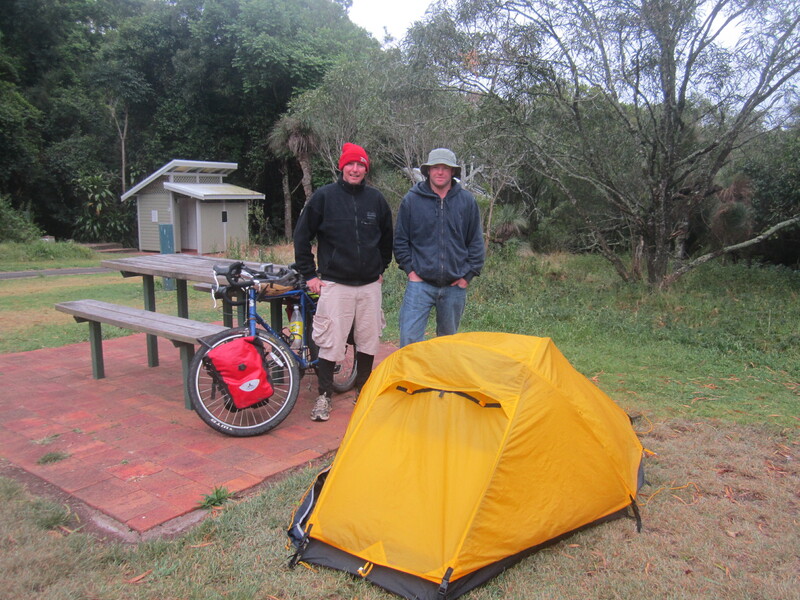 I was up and packing the tent away at 4:45 a.m……….It was already light enough for cycling. The earlier I start the easiest it was going to make the day. Getting closer to Brisbane now the roads are going to be hectic. Even at 5:30 a.m. there was a bit of traffic. My first target for the day was Caboolture which was completely built up with shopping mall after shopping mall and every fast joint thinkable. I stopped at the police station to ask directions. Their help pointed me in the right direction. Surprisingly the next 30 km went very well and I was able to navigate my way to my cousin’s house in Scarborough. 9 a.m. was 3 hours earlier than I had estimated so I cycled down to the water and waited for Alison to get home. One week in Scarborough went very quick. The first few days I was stuck on the computer and in between taking full advantage of the swimming pool. My cousin and her family have a visitor every morning. It is a grey owl that comes every morning and sits on the downpipe and sleeps all day. On Saturday, Alison, her husband Zane and two kids, Hannah and Thomas took us up the coast for a nice drive to visit a chocolate, macadamia and ginger factory. Sunday morning, we all went down to the Redcliffe market for Cornish Pasties and a walk out to the Redcliffe pier. Along the beach were hundreds of big blue jelly fish. On Monday, I went for a big long walk from Scarbrough down to Woody Point along the coast. 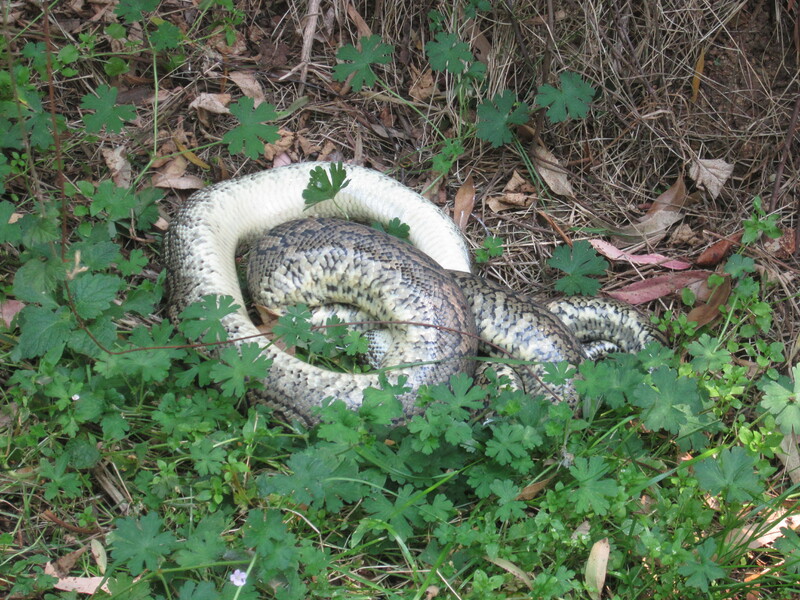 Along the way I saw a snake which moved in some bush next to the footpath. I didn’t take a too closer look. In today’s newspaper is a story about a guy up north who died instantly after being bitten by a Taipan snake. Memorials of the first European settlers to Queensland that landed in Redcliffe are marked with a memorial wall. After 9 km I got down to Woody Point. There was a shipwreck to view and I went for a walk out to the end of Woody Point pier. 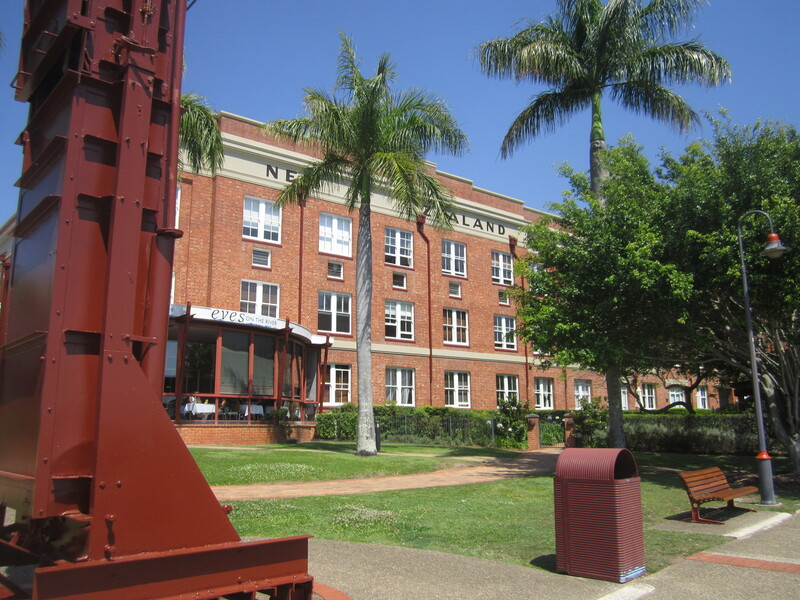 On Tuesday I went to the local Redcliffe museum for a few hours…….to get a bit of the local history. 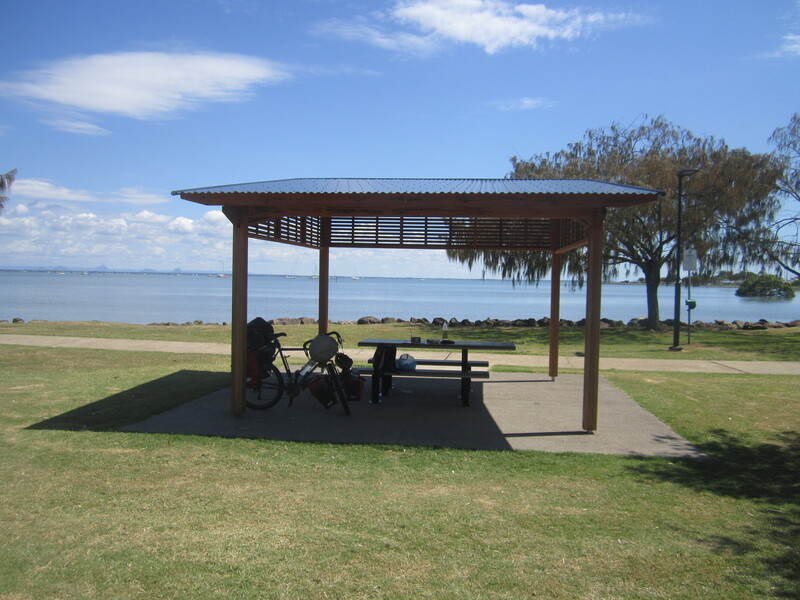 Redcliffe’s claim to fame is that the Bee Gees grew up here as kids. In the afternoonI was back home to watch the Melbourne cup. Put a small bet on just be part of the race that stops a nation. Bracken Ridge to visit some old friends from New Zealand. Shortly after my arrival a reporter from the Bay Side, Brisbane’s largest northern side newspaper, came round to do an interview. Moving down to Bracken Ridge has been a week of catching up with lots of old friends. Some people I have known from early childhood. The list goes as follows. I went to primary and secondary school with Steven Reynolds and he came over and took me out for a beer and a catch up one afternoon. 7 years since I last saw him. Jane and Allen are friends of my sister and I last saw them in London. They now live in Brisbane and I caught up with them when they kindly took me out for some Mexican. It didn’t stop there. Within walking distance from Mary’s was her daughter Camille and her partner Shawn and Camille’s kids, Arron and Shanon, who I have known ever since they were born and are now 21 and 19. More catching up was done on my last night when I went over for dinner at Mary’s other daughter Debbie for a very nice dinner and one super Pavlova and caught up with her dad Allen and her kids Grace, Maddy, Aden who are 9, 6 and 2 and after 7 years are a lot more grown up since I last saw them. 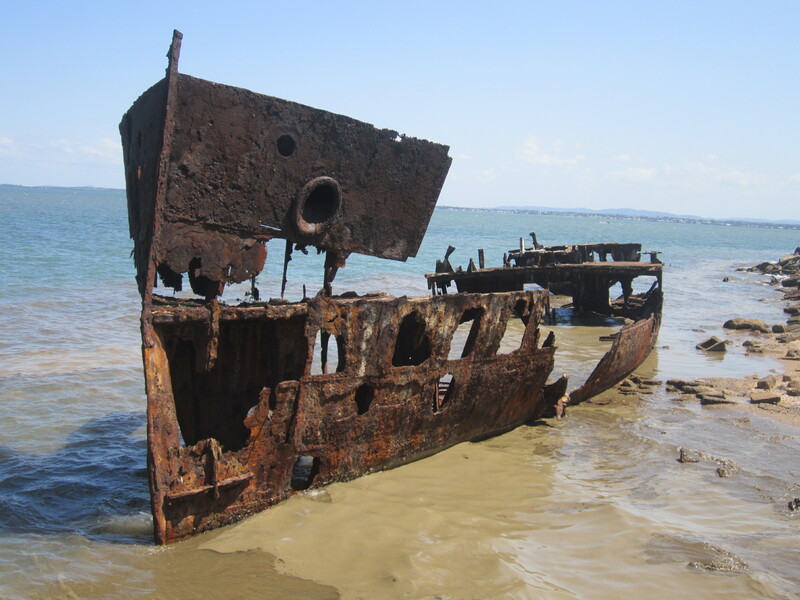 I have been making enquires about the boat to New Zealand from Melbourne. It looks possible. But the 5 day trip on a freighter is not cheap at 825.00 Euros. Reality is starting to set in that this awesome adventure will soon be coming to an end. I am already having nightmares with the thought of having to work again. But saying that I am realistic and I have set myself some more goals. The only way I am going to achieve them is if I wrap this trip and get earning again. 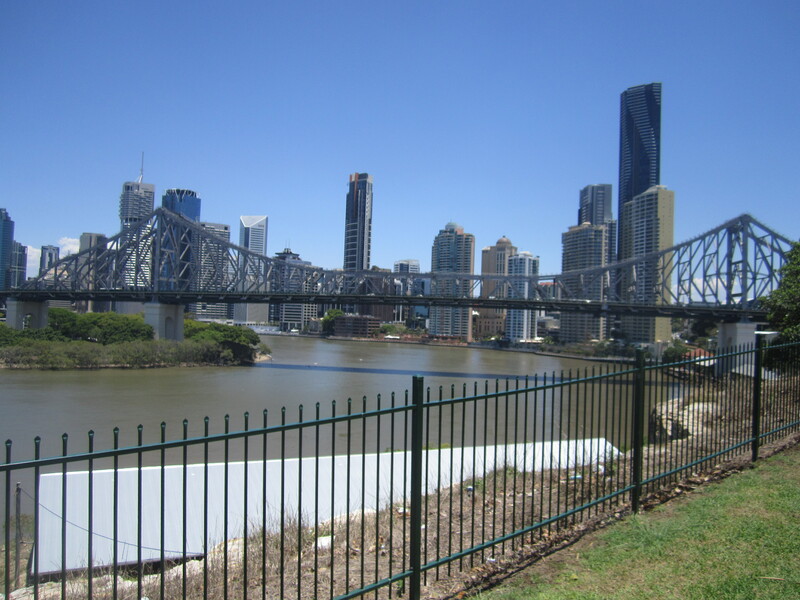 Today I have another big day ahead of me…………cycling a whole 25 km into the centre of Brisbane to visit my friend Heather and her family. I met Heather 8 years ago when I was in South America. Around 10:30 a.m. I said goodbye to my host, Mary, who with Allen treated me very well for the last week. I even left with sandwiches and Christmas mincepies for the cycle in. It didn’t take me long to get down to the river. From here I needed to get the fast cat across the river to Builemba. I was about two hours early, so I sat on the river and ate my packed lunch followed by a little sleep. 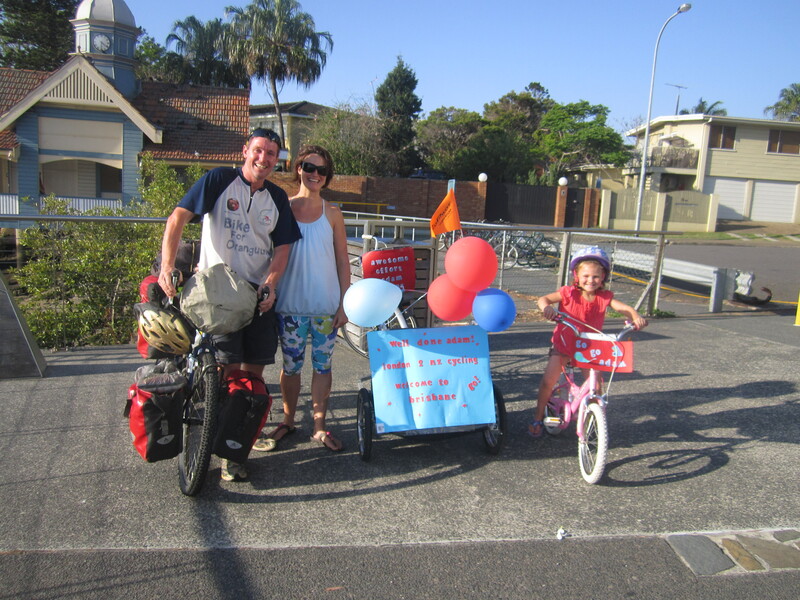 Shortly after getting the very cycle-friendly ferry across the river I was met with a very warm welcome from Heather and her two children, Isla 4 and Neve 2 on their bicycles with balloons and banners. Day 594: Thursday was a lovely sunny day. With our bikes Heather and I caught the ferry over the river to Tenerife. From here we cycled down to the old Power station at New Farm. The wide sealed trail runs between the river and multi-million dollar houses. The area was once full of wool houses. Some of which remain and are now apartments. It’s a bit of a heritage walkway as well because many signs indicate the history when New Farm was a major submarine base in the second world war. After coffee at the power station which has been converted into an arts centre we got the ferry back over the river. I had been invited to come and visit Isla Kindy. They have been following my progress for the past few months. 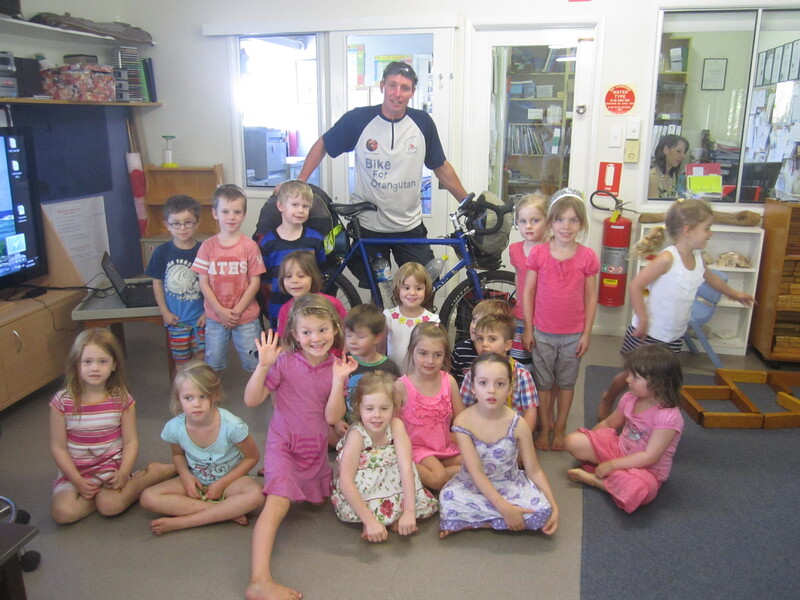 Last week they had a ride to Kindy day and very kindly raised some money for my charity, Asthma. I brought my bike fully loaded in to the Kindy. I talked and answered questions for about half an hour. I also put on a bit of a slideshow. Photos of Pandas in China were a winner. Day 596: Saturday morning I was left home alone and we got the mother of all storms.It came in so quick. 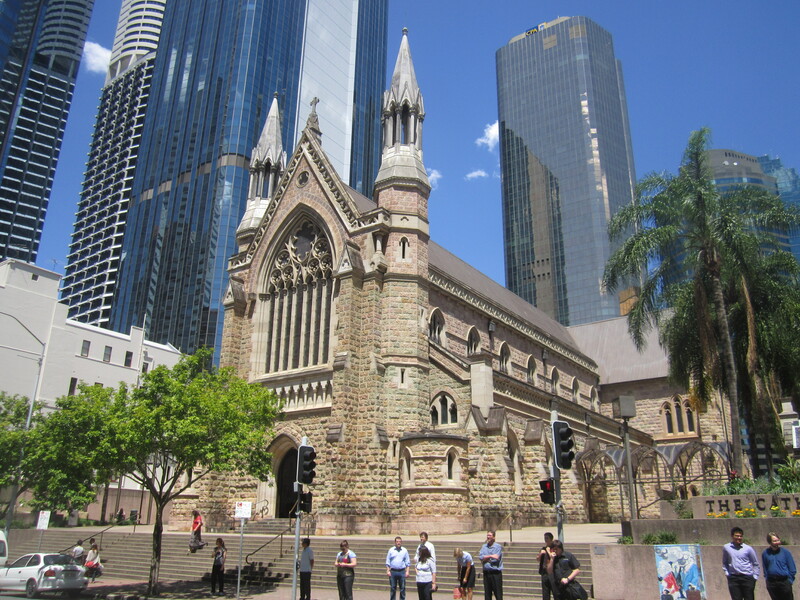 The storm caused massive amounts of damage through out Brisbane. Day 597: Sunday – I ventured in to the city to catch up with a couple of people I worked with over in Europe when I was with Contiki. It was great catching up with Cathy and Gympie. It was just like yesterday. On the way home I got caught out in another severe storm. From the ferry terminal I watched some spectacular lightning. Day 598: Monday – After a couple of stormy days it was nice to see the sun back. I took the ferry over the river to Tenerife. I then walked down to the power station. I went for a bit of a look around inside. Full of character with a mix of new and old. There was a free photo exhibition documenting the Bangladesh civil war. I then continued to walk into the city. Had a great view of the storey bridge from the cliffs opposite. Midday I met another old friend from Contiki for a quick drink during her lunch break………..again it was just like yesterday. There is a walkway all along the river. I continued upstream and passed through the botanical gardens. I then walked back through the city. Among the many high rises are many heritage buildings full of character and artistic beauty. 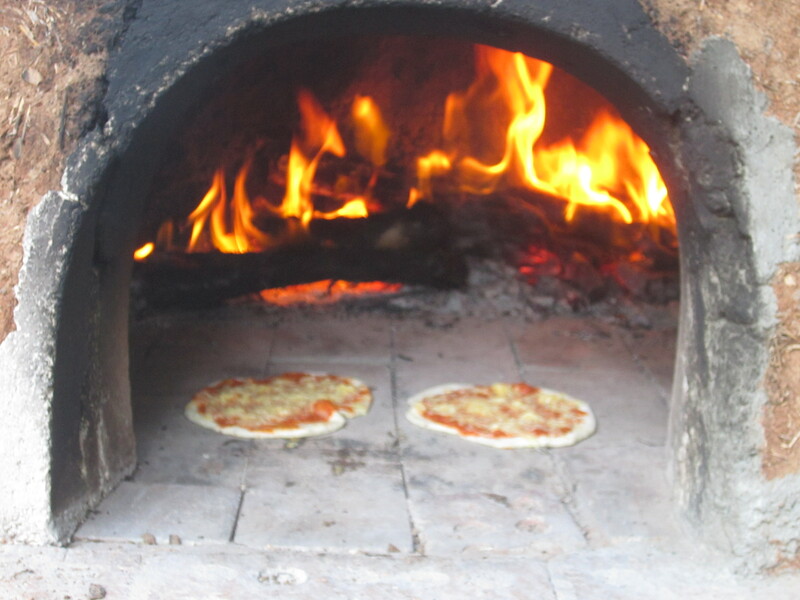 The day ended very nicely with Heather, her kids and I going down to the allotment to use the mud oven to cook some very nice homemade pizzas. It was great fun and nice to be out in the garden. 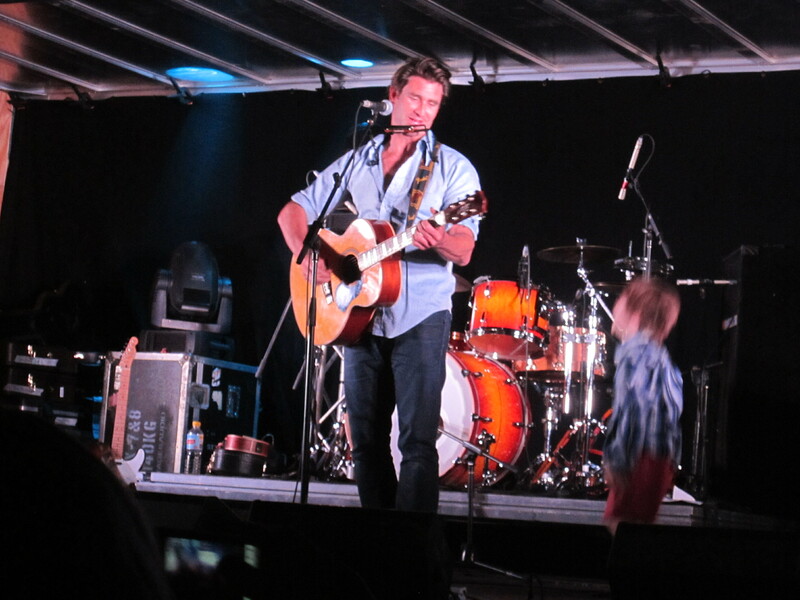 After spending a really nice week with my friend Heather and her young children Isla and Nevis – it is time to move on. I am heading down the Gold Coast to visit my friend Lynda who I also worked with at Contiki. Coincidentally, I ran in to Lynda a few weeks ago when I was cycling in the Bunya National Park. Heather has been very pro-active on my behalf and the Garage. An upmarket supermarket and cafe have invited me round and kindly helped me out by donating some food and promising to make a donation to my Fundraising page for Asthma. I have some company for today’s ride. 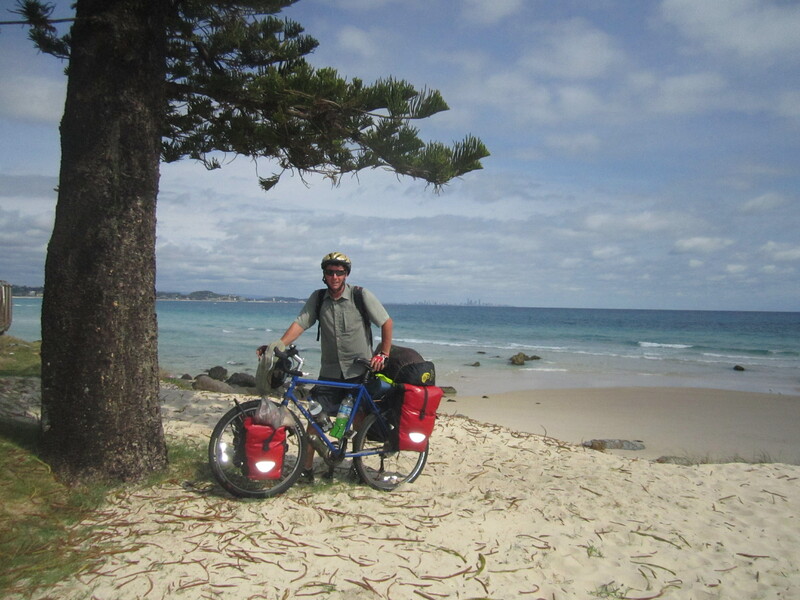 My mate, Steve is going to ride with me and help guide me to the Coast. He will then get the train back. Heather and the girls cycled with us through the park before waving us off. It wasn’t that straight forward cycling to the Gold Coast. The motorway is out of bounds and many small roads are needed. A few times we weren’t entirely sure we were on the right track. In all, the traffic was not too heavy but it was a bit hilly. Steve did well getting me to Coomera station which is next to Dream World. From here, Lynda came and collected me and I followed her home. You would think that after 3 weeks of taking it pretty easy that would be the last thing I would be doing. Well in fact that is exactly what I did for the two days I had at Lynda’s. Walked to the shops twice and the rest of the time watched DVDs and cricket. I am getting company again for the second time in as many cycling days. 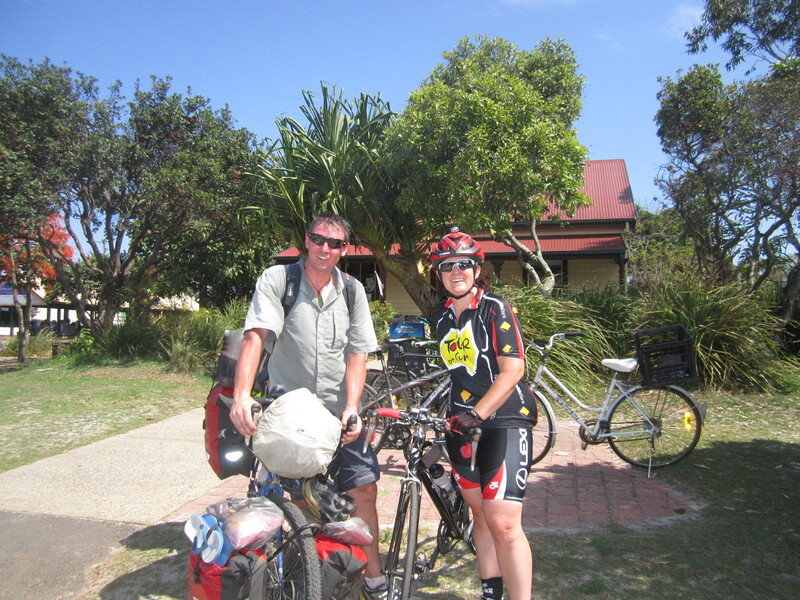 Lynda is going to cycle with me as far as she can to Byron Bay and then get her dad to pick her up. We set off just after 5:30 a.m. in a very nice cycling temperature. Lynda is going to take me on a route that will mostly avoid the highway. Just 20 mins into it we had a bit of a lucky escape. We had just crossed over the highway and was passing through an intersection. We were just about on the other side when a stationary car proceeded to move into us. Lynda braked. I had nowhere to go but straight into the car. I braked hard moved out slightly and my front wheel clipped the back of Lynda’s bike. She stayed upright but it was enough to make me lose control. I stayed upright………but the bike didn’t. I guess it could have been a lot worse. I was left shaking but remained calm. Picked my bike up and moved to the side of the road. Put the front pannier back on, restraightened the handlebars and continued on our way. We took the scenic route through the Gold Coast suburbs. Lots of nice waterways. 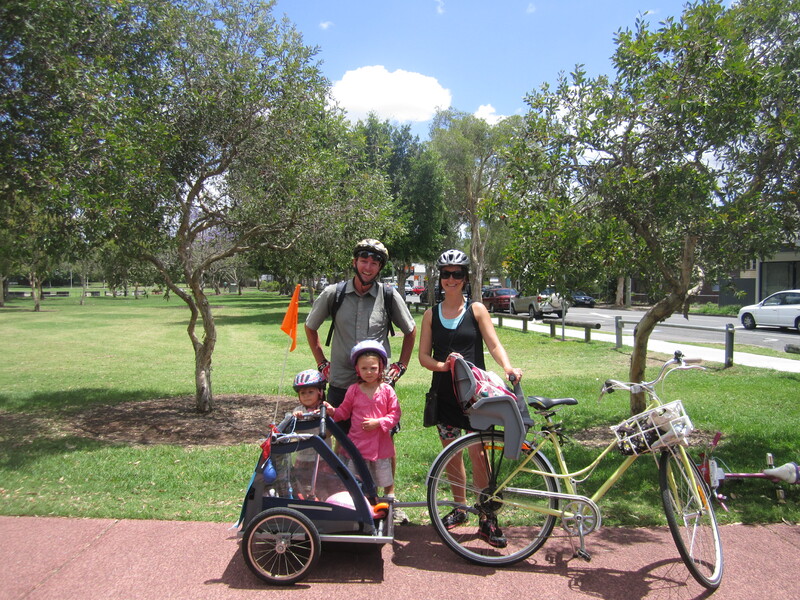 We cycled along the water in to Surfer’s paradise. At 6:30 a.m. there were loads of people out and about – cycling, walking the dog and exercising in the park………not to mention swimming. We got through Surfaces alright and the high rises diminished to a more surburbia feel. It then became a very scenic drive down to Byron Bay. Lots of water with inlets and rivers. Mango swamps made things nice and green. 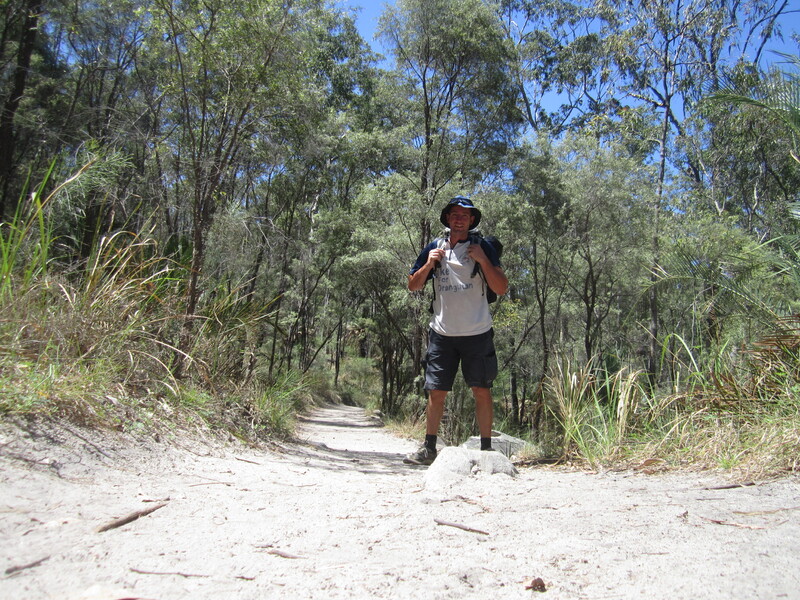 We still had a few testing hills along the way………..but just what I needed. 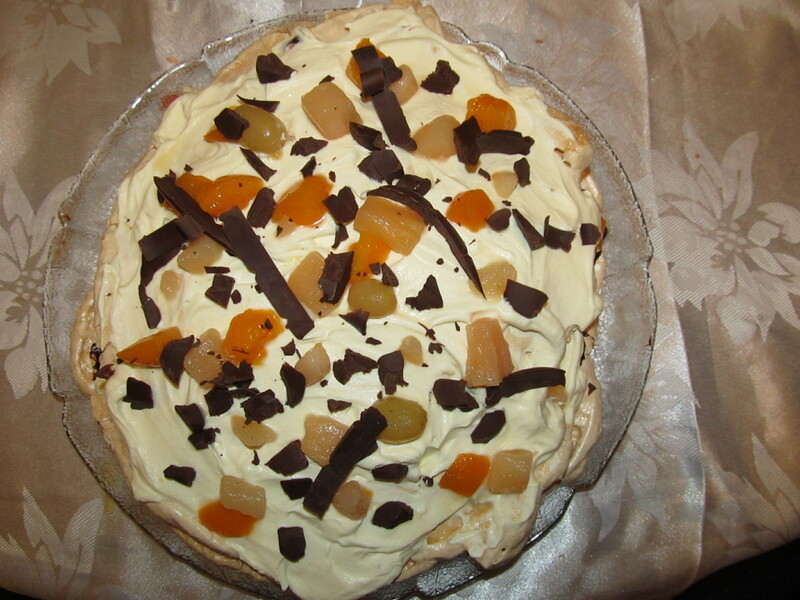 I have been fattened up with a lot of good home cooking in the last few weeks. After 50 km we changed states as well as time zones. We are now in New South Wales and an hour ahead. 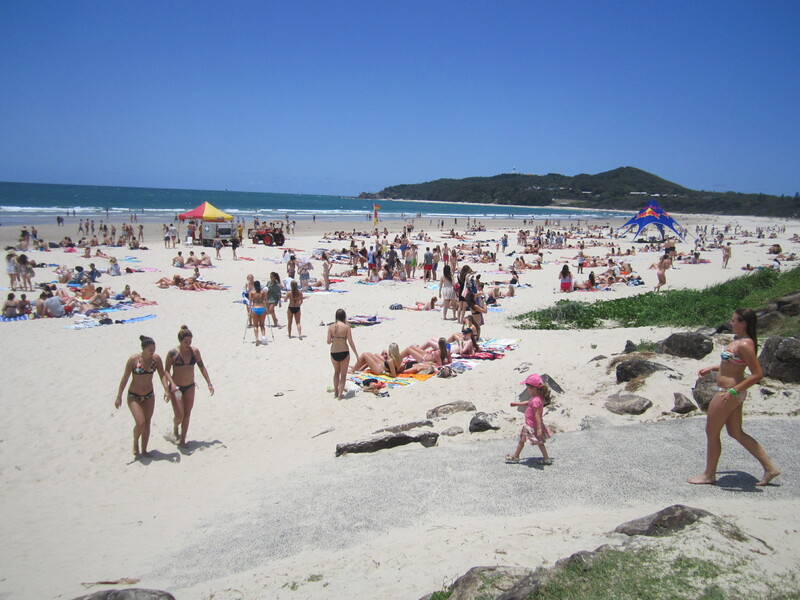 Cycling into Byron Bay, the little town was absolutely heaving with Schoolies. They have finished off year 12 and now they are letting off steam. I thought they all went to the Gold Coast. So it caught me by surprise. 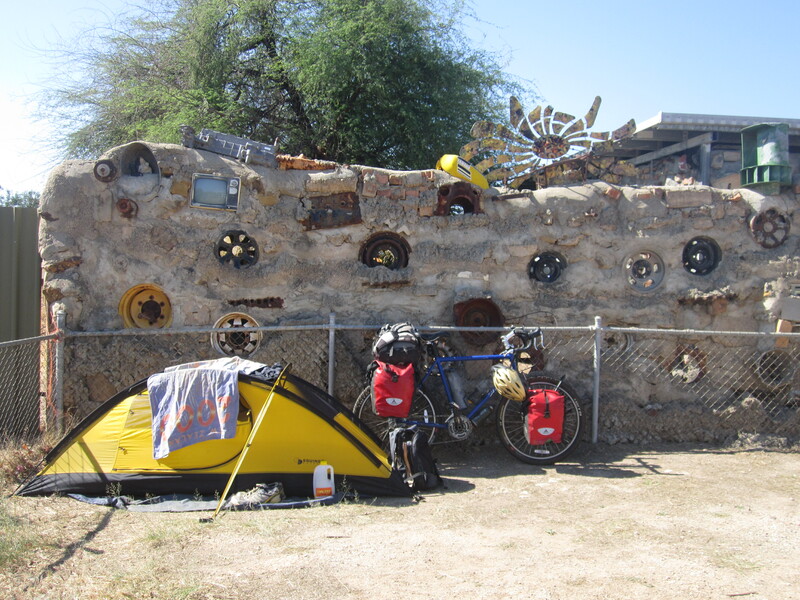 I said goodbye to Lynda and her dad and I then cycled a little bit back out of town to a camp site. Not badly priced at $15.00 but it too was full of schoolies. I wonder what tonight will hold – whether they will be running amok or not ?